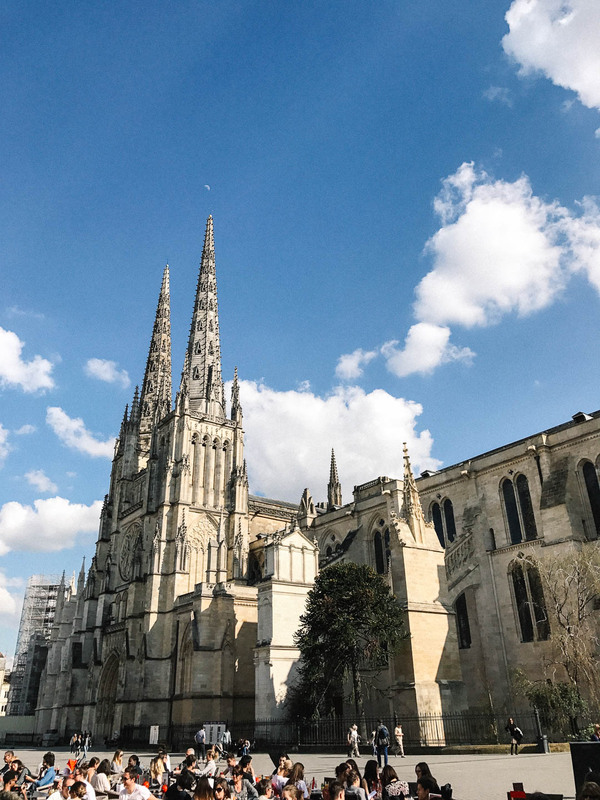 The train journey from Paris is so easy, only taking 3 1/2 hours (from next year, there will be a new faster train which will only take 2 hours from Paris! 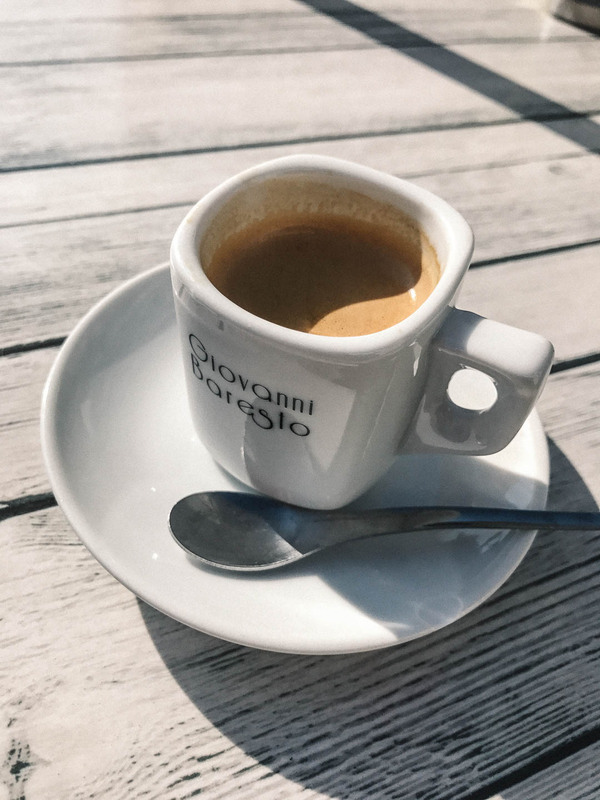 ), and the trains are so spacious and clean – making the whole experience very easy and stress-free – always a good start to a holiday. 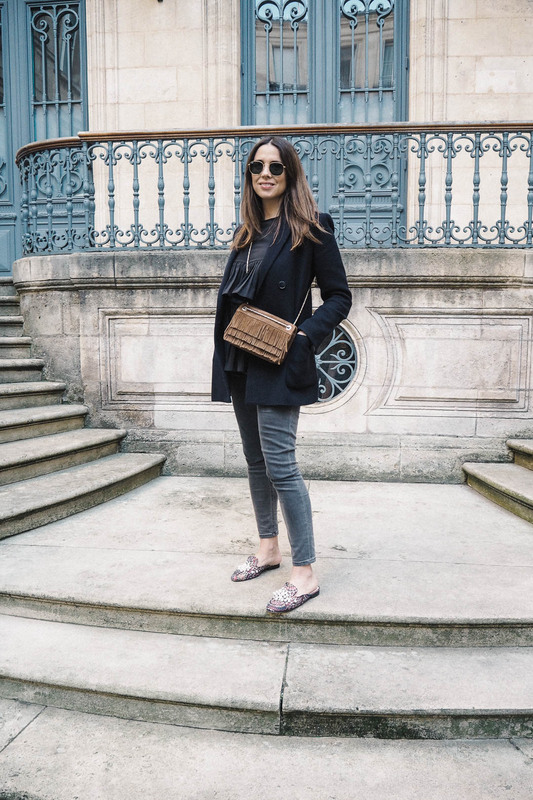 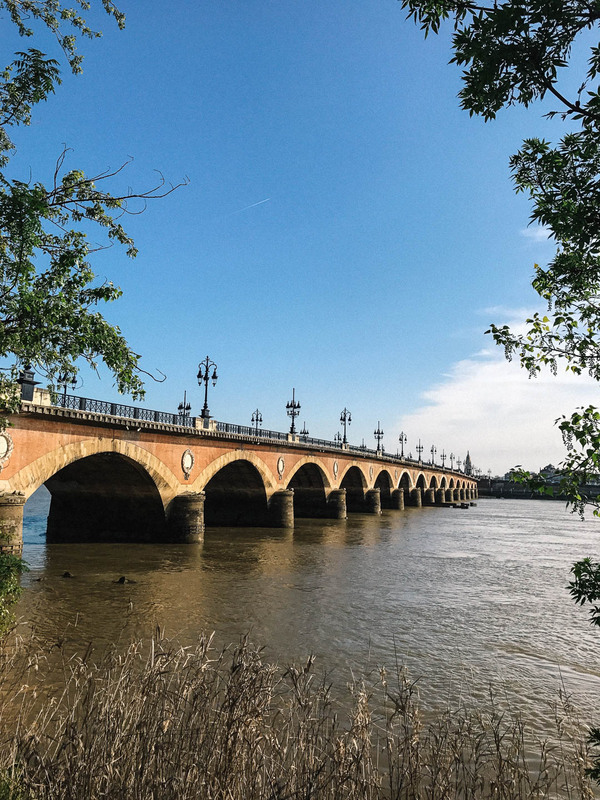 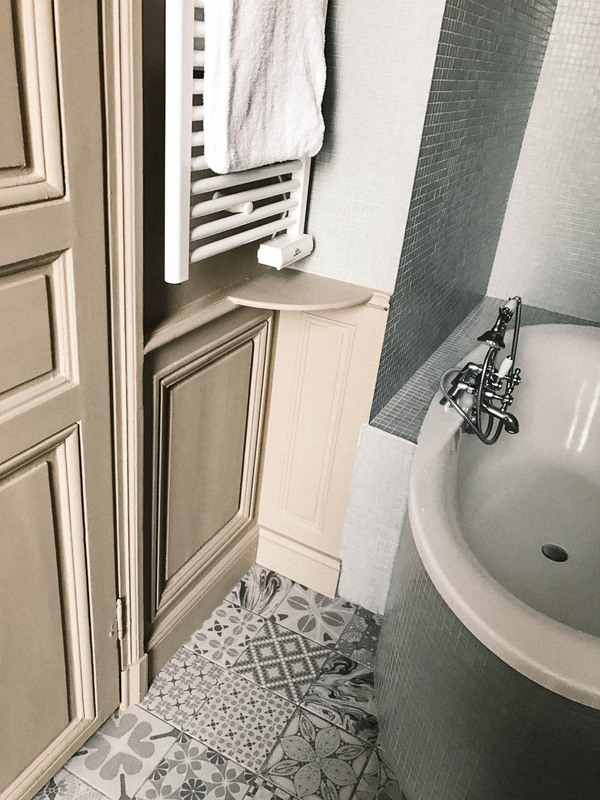 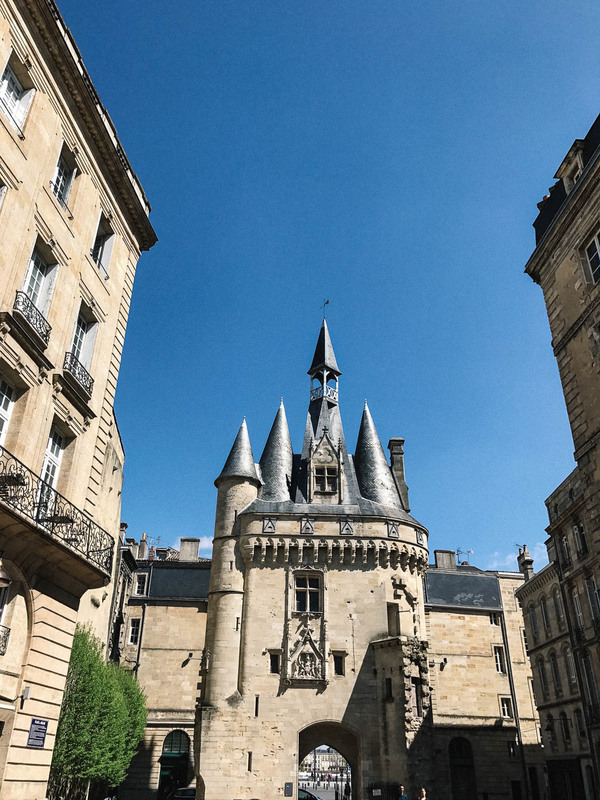 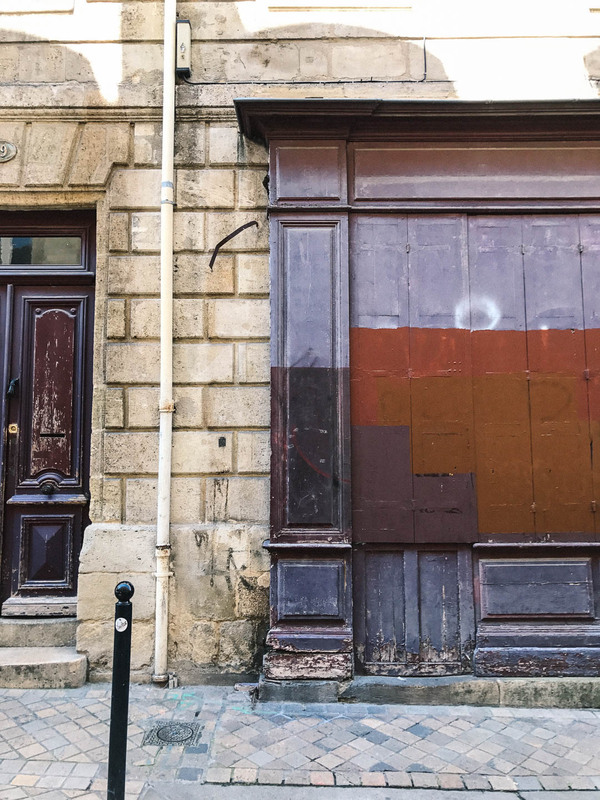 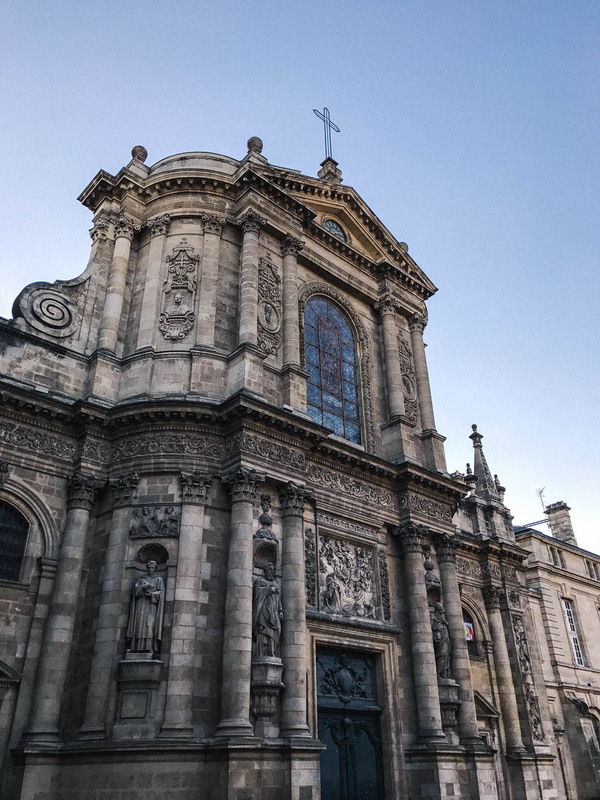 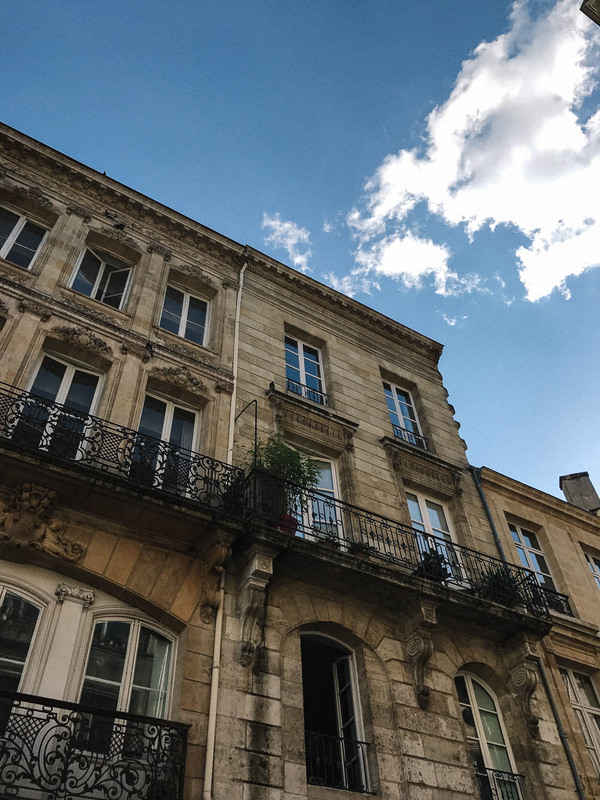 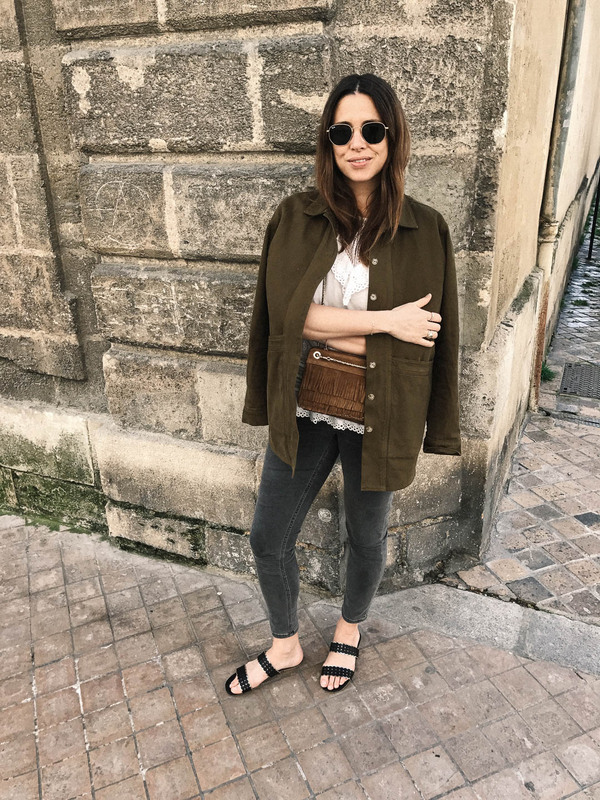 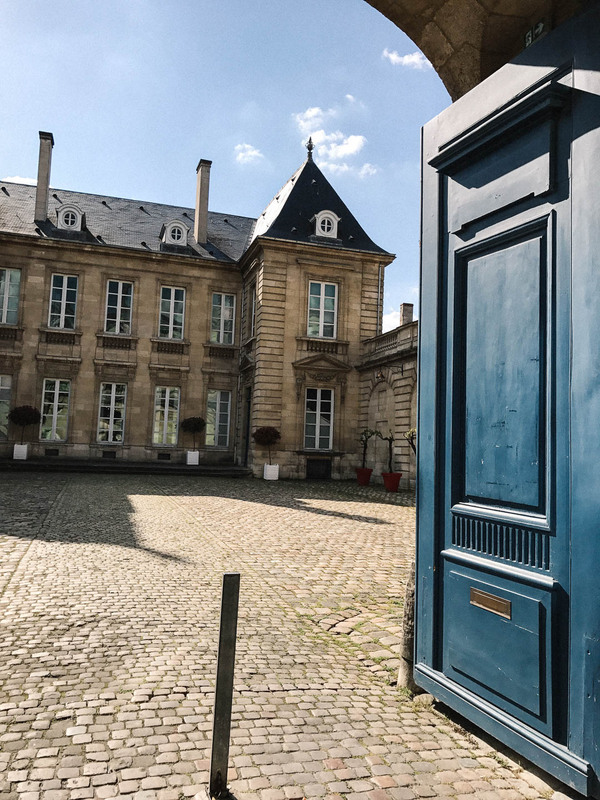 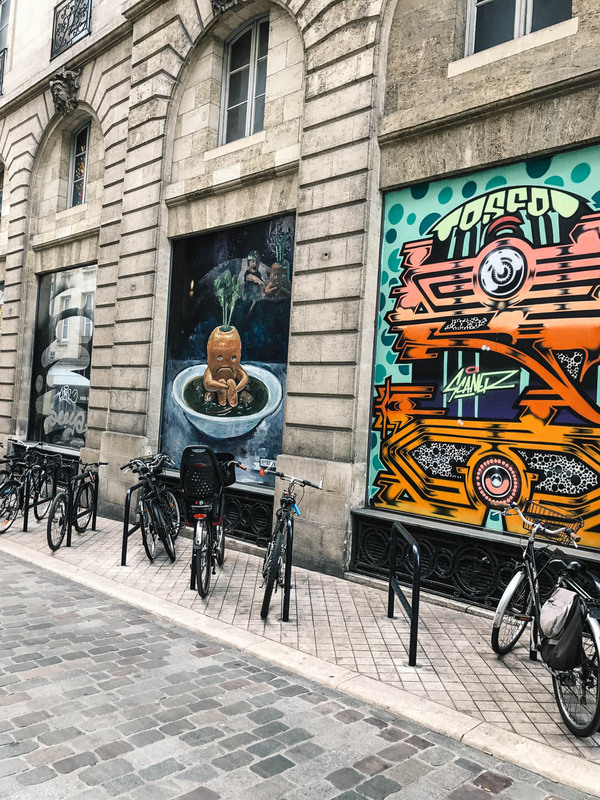 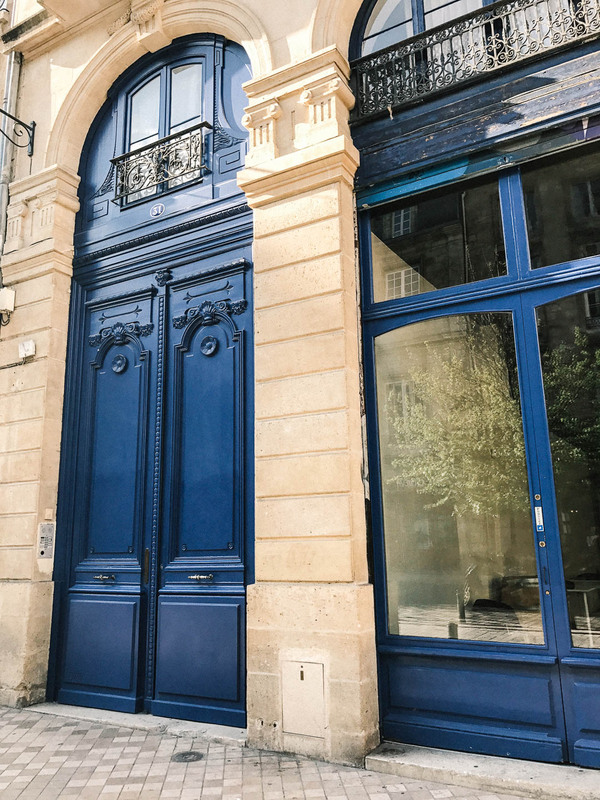 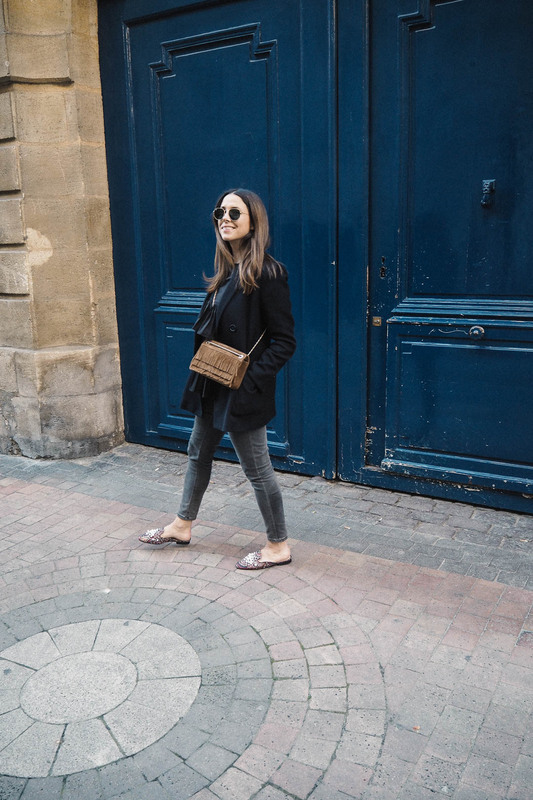 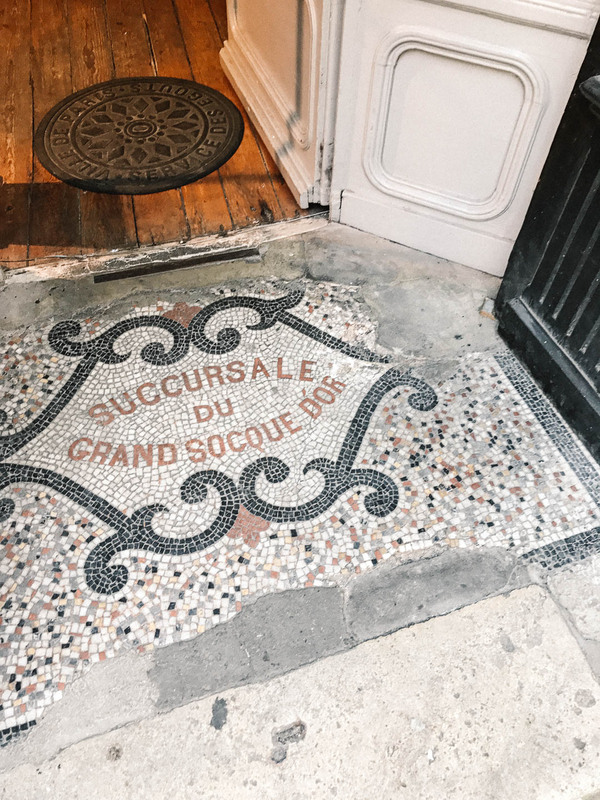 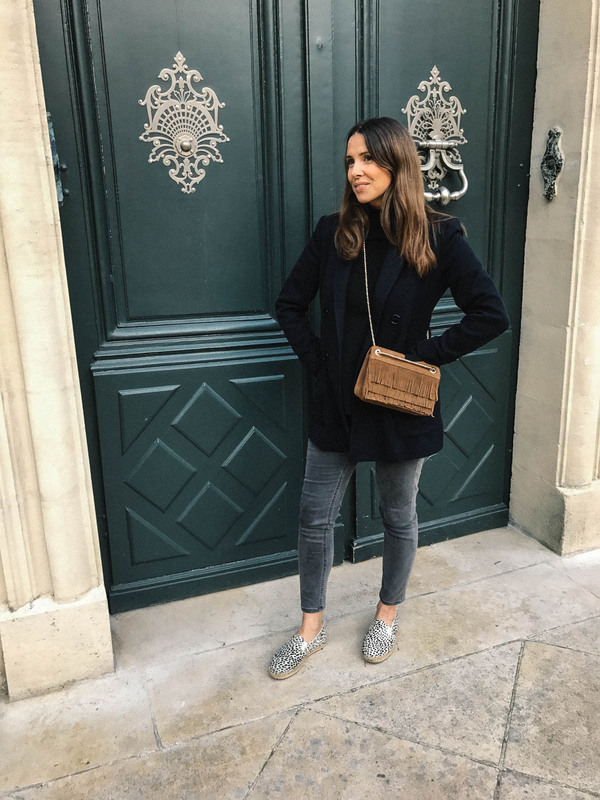 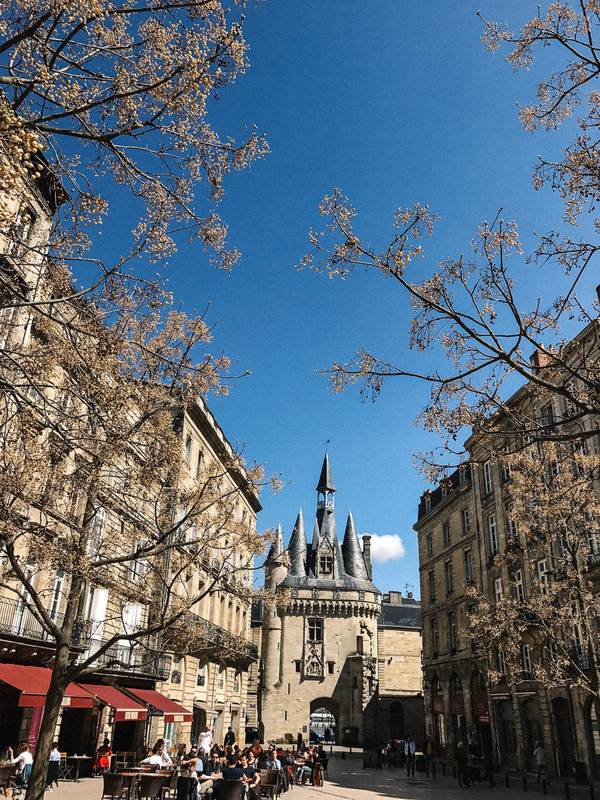 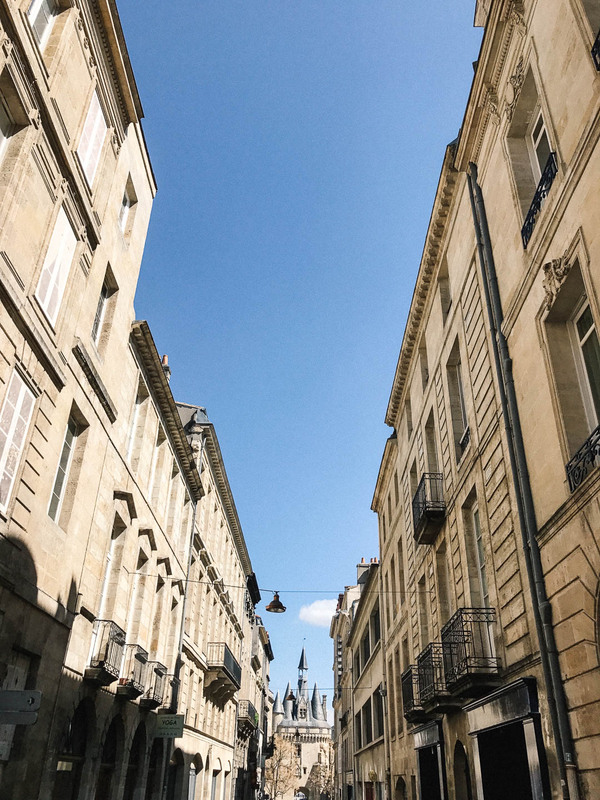 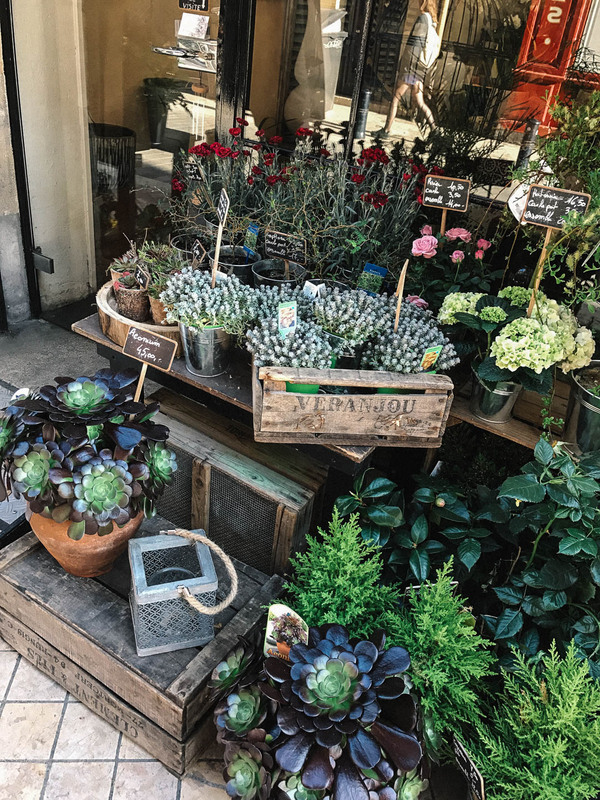 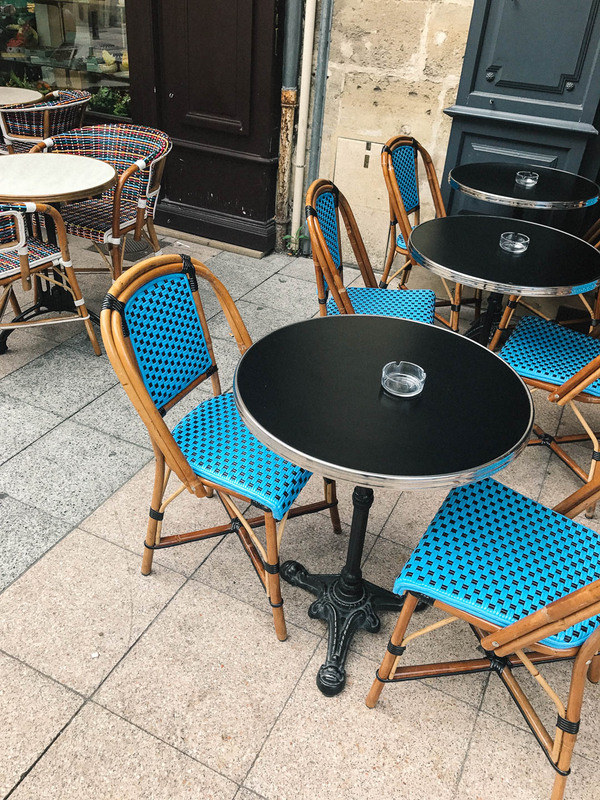 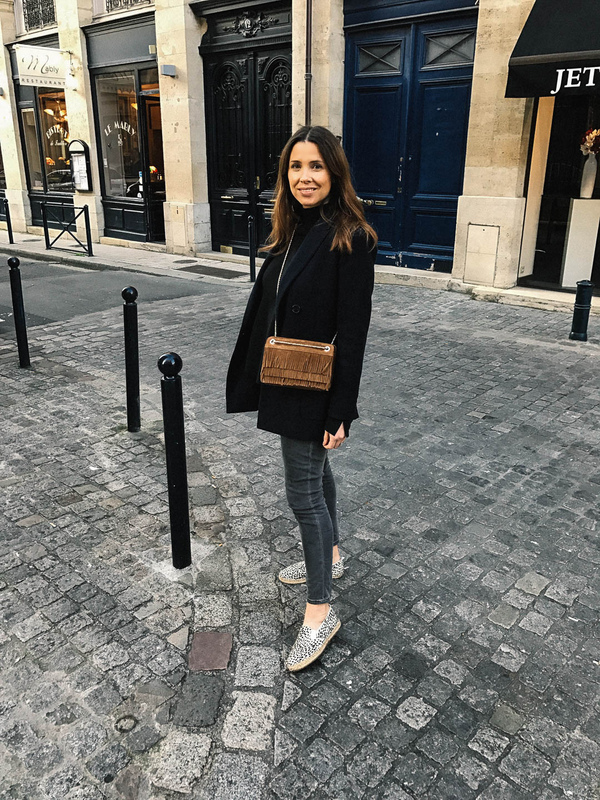 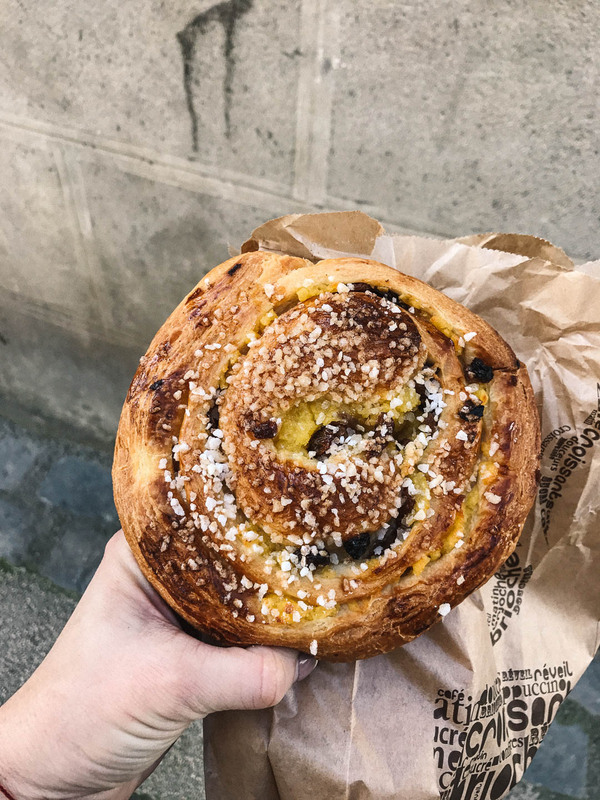 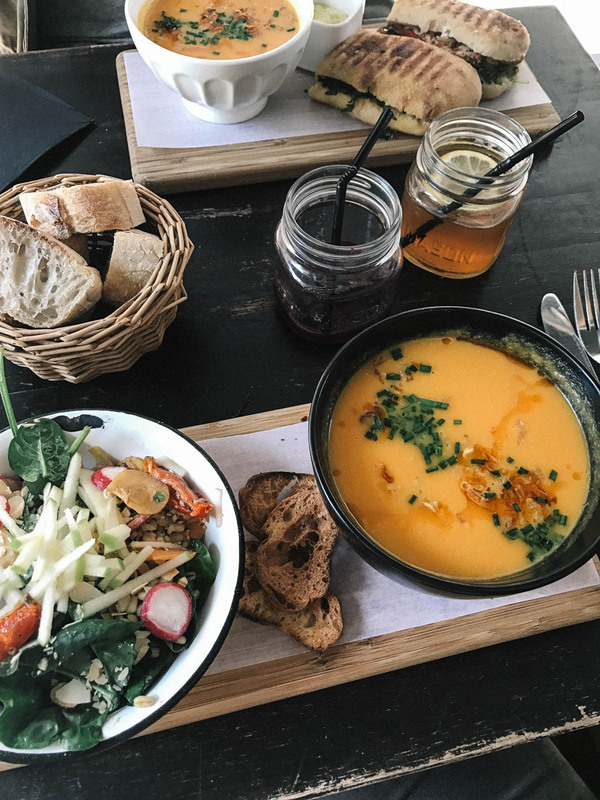 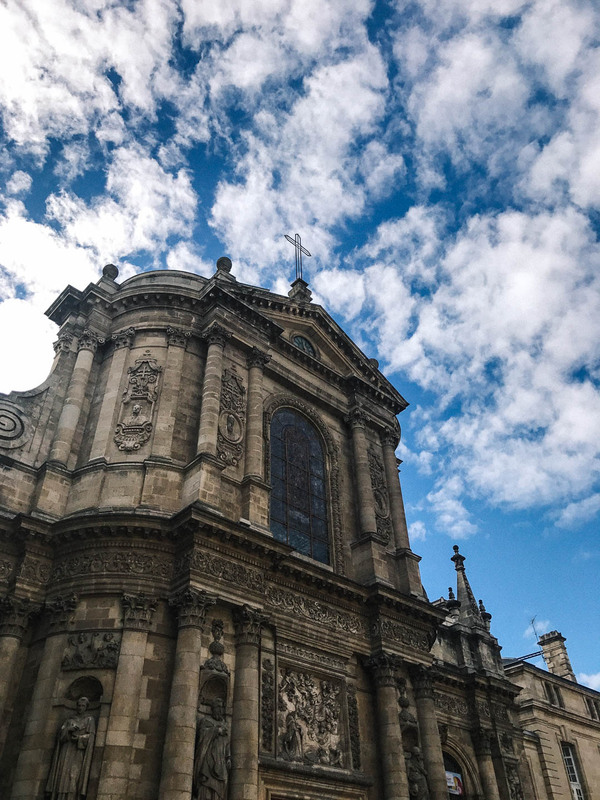 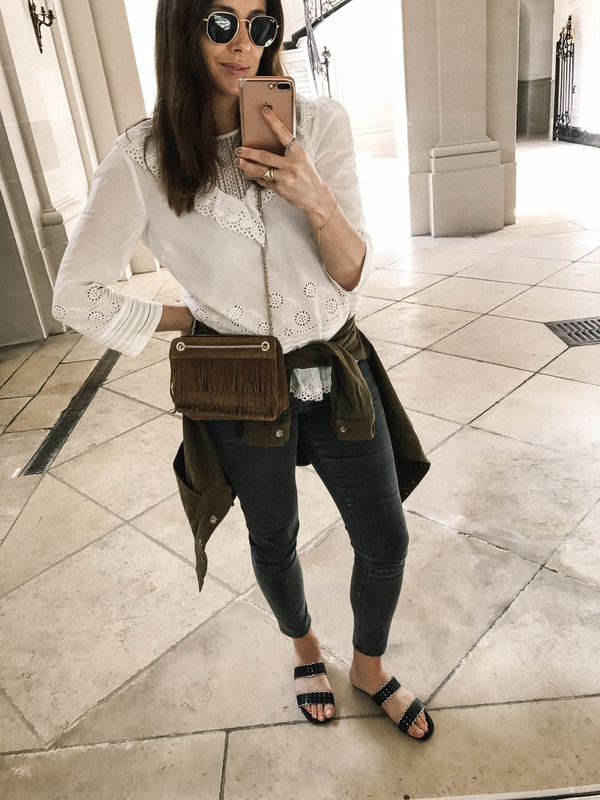 After grabbing some deliciously healthy and wholesome lunch at Plume – we strolled the 2 minute walk down to our accommodation in the heart of Bordeaux. 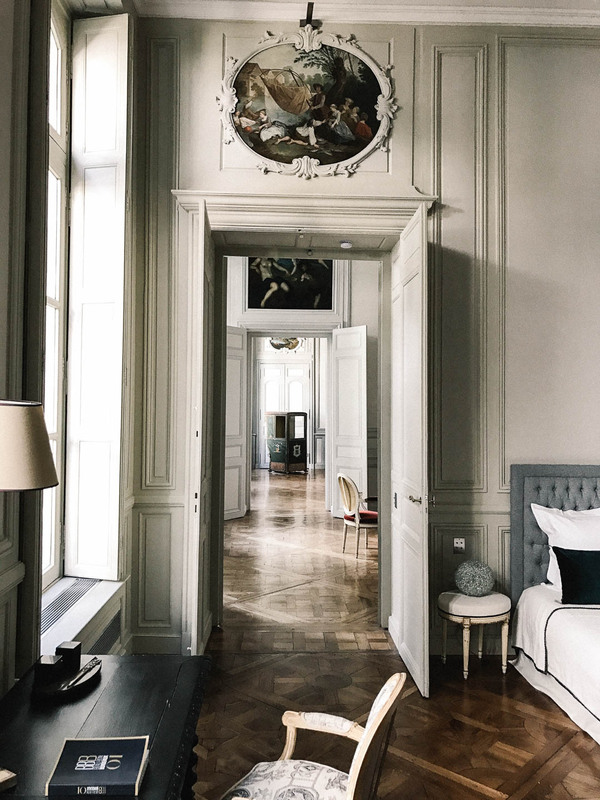 We were both so excited to check into Hotel de La Tresne – a grand, luxury apartment restored and magnified to it´s 1700s era. 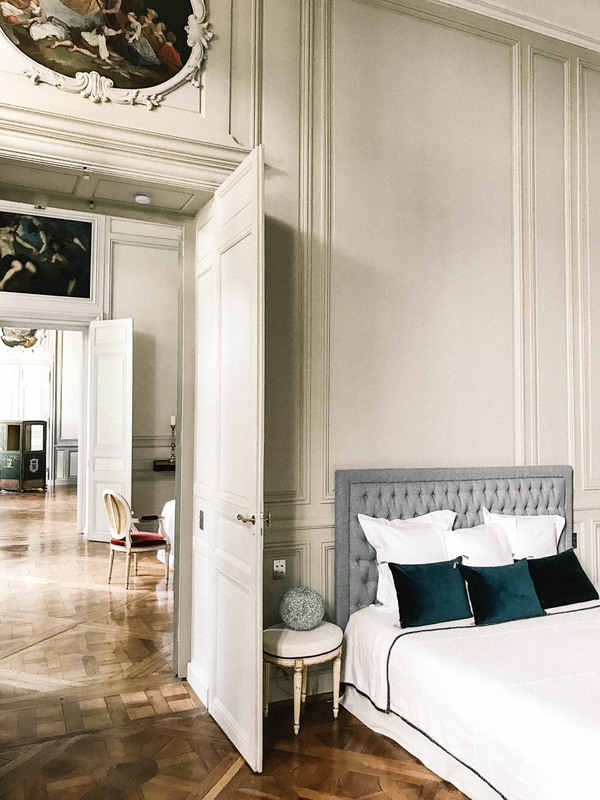 The gated apartment lies within a large manor house, with lots of other residential apartments, and Hotel de La Tresne occupies one of the biggest ones, with 3 double bedrooms, a grand reception area, dining room, kitchen and 3 bathrooms (!). 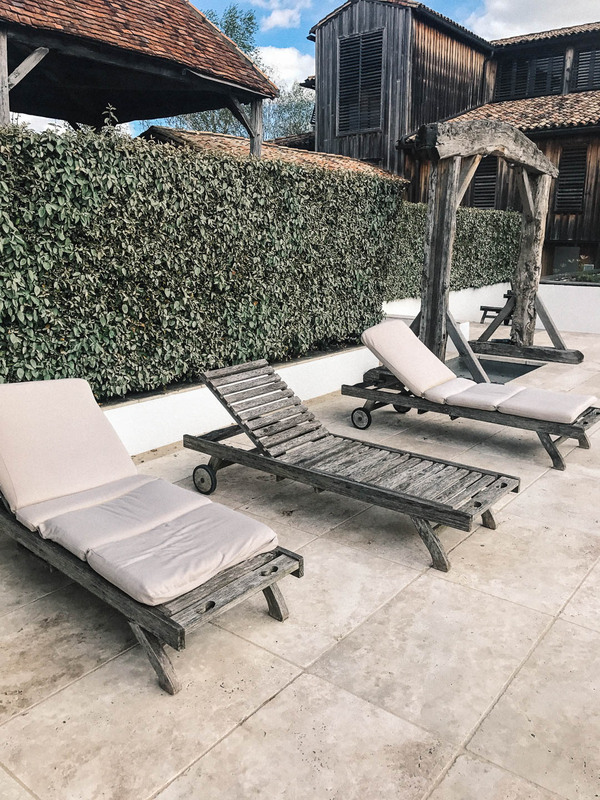 Obviously, it was extremely spacious for just the two of us (although we were certainly not complaining) – but I can imagine it also being the perfect spot for a family or a group of friends. 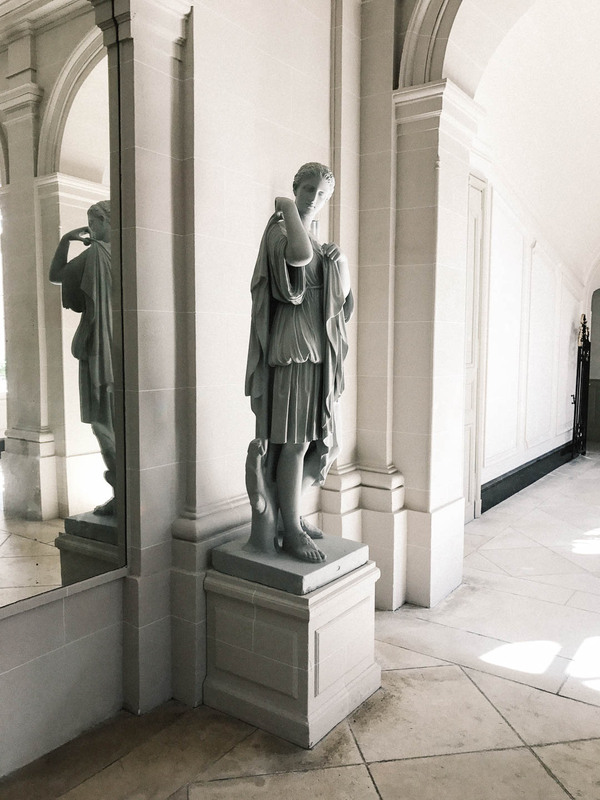 As soon as one steps into this place, one can just feel the history and depth engrained into the walls. 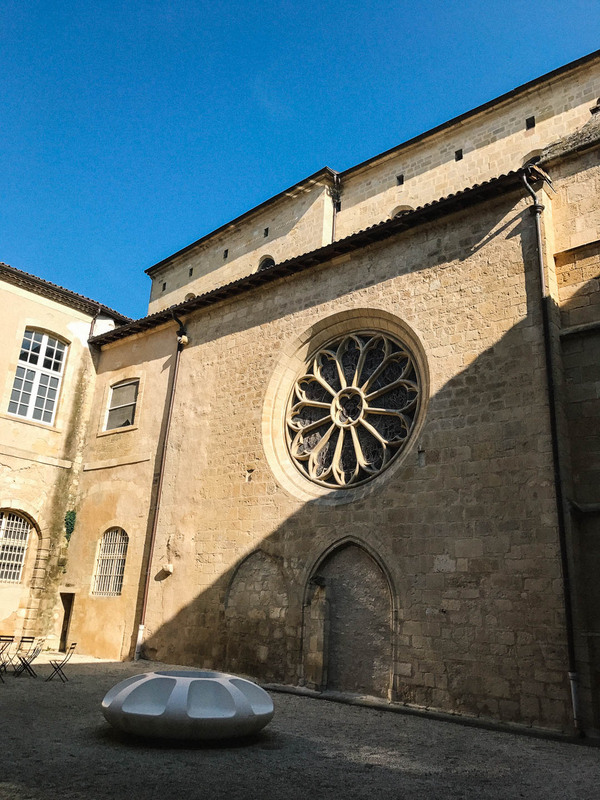 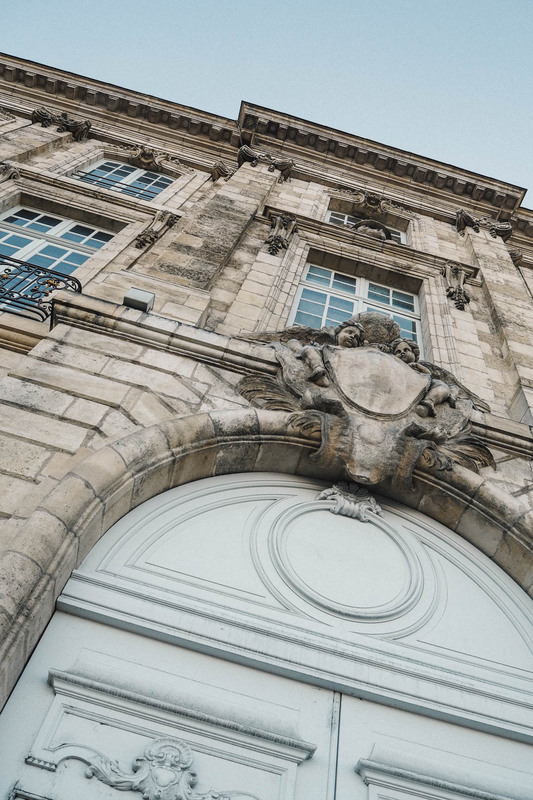 We instantly wanted to know the history behind it, and found out that it was built is 1752 for the Marquis of La Tresne and later housed the headquarters of the daily regional newspaper ‘Sud Ouest’. 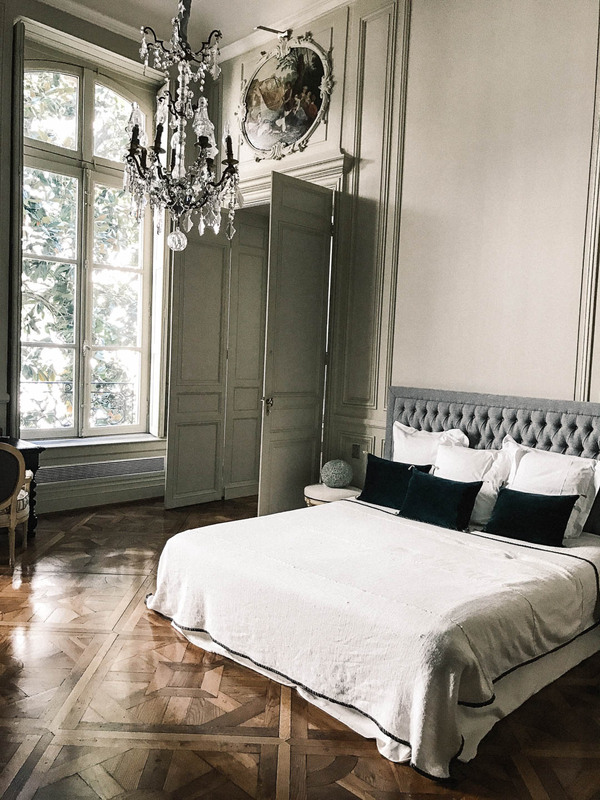 Only a few years ago, it was beautifully restored to it´s splendor of its original architecture – with the reclaimed wooden floors, cornices and rosettes, fireplaces and tapestries. 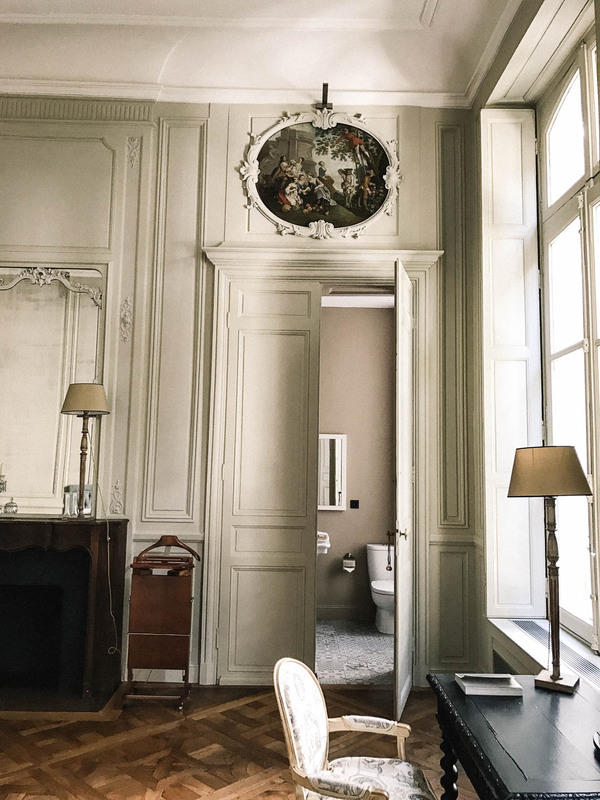 Needless to say, we felt incredibly grateful to be staying at somewhere so preciously unique. 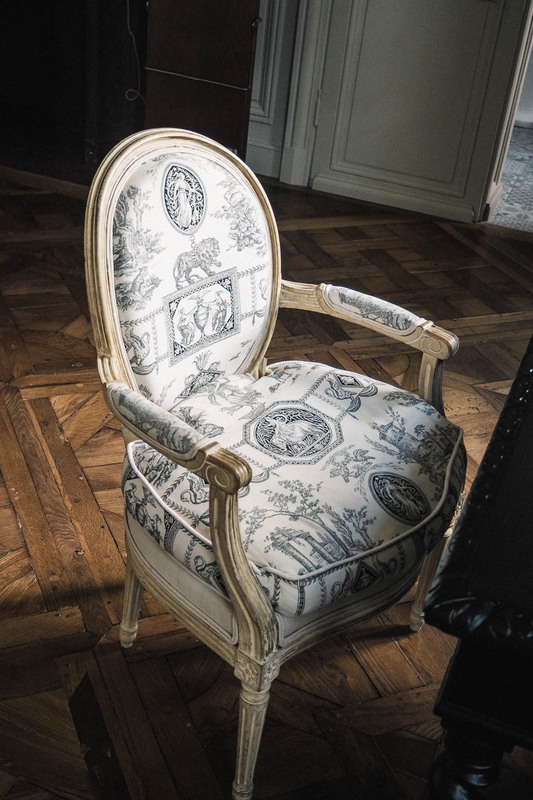 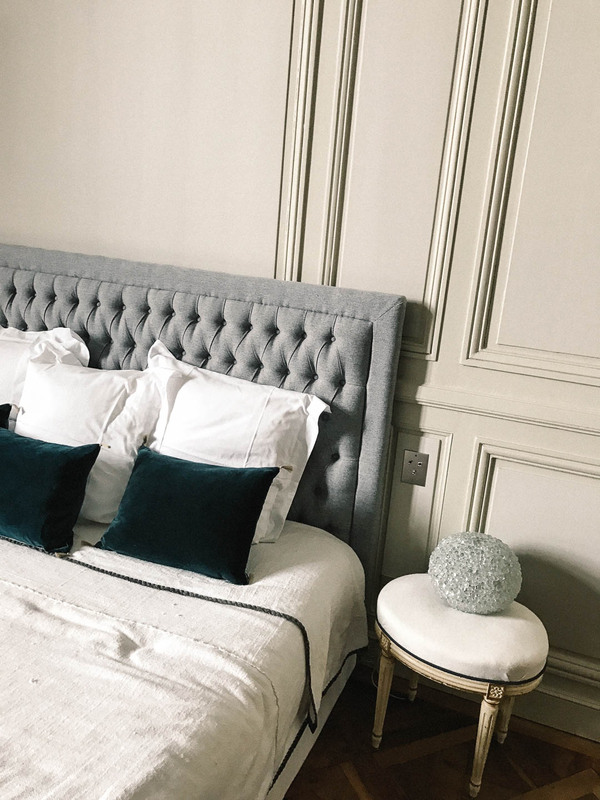 Every single room is immaculately clean, and the attention to detail in every corner; mixing traditional lines with more contemporary furnishing, is spot on. 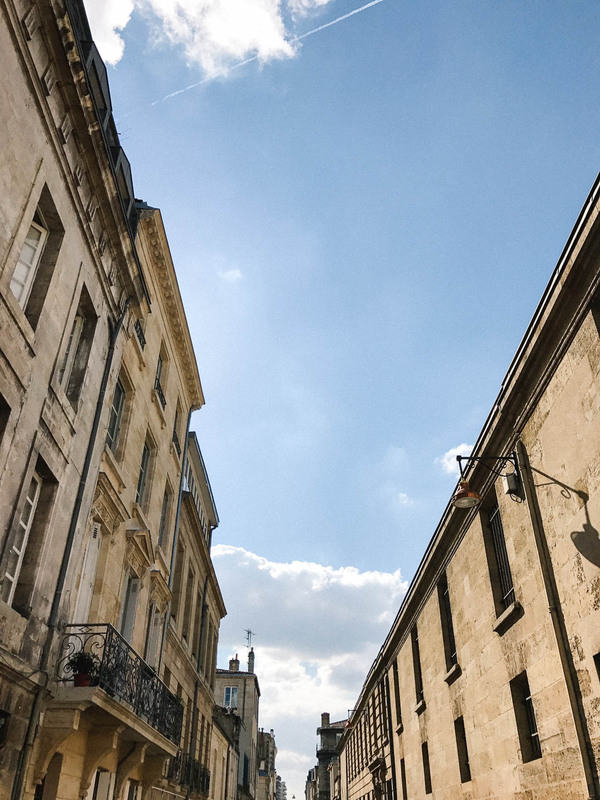 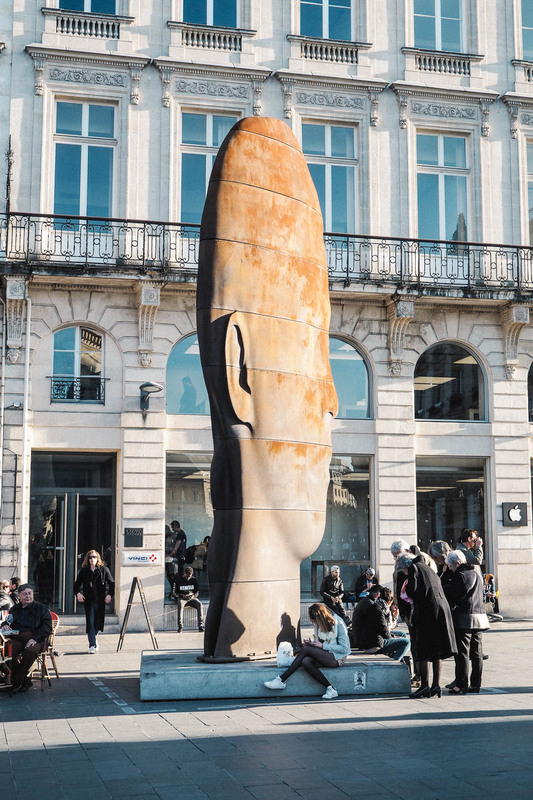 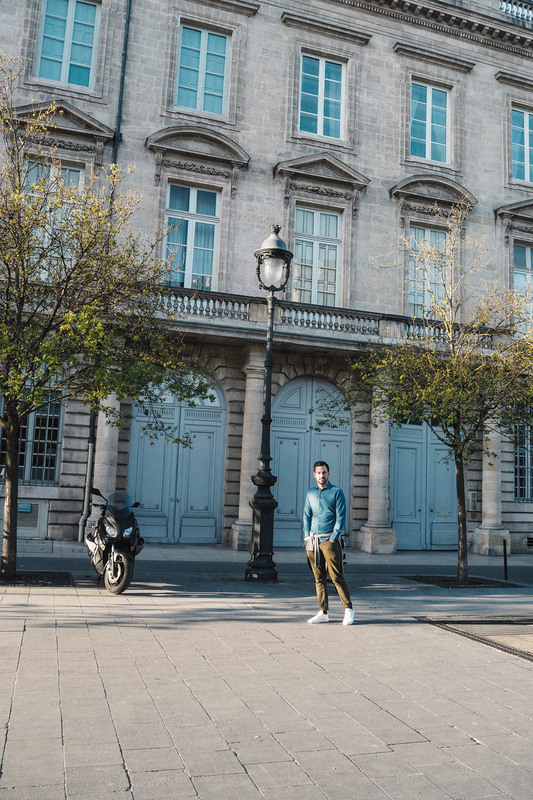 Everything is thought of in terms of comfort, rest and pleasure, and it´s one of those places which truly feels like a hidden gem, in the heart of the hustle and bustle of Bordeaux. 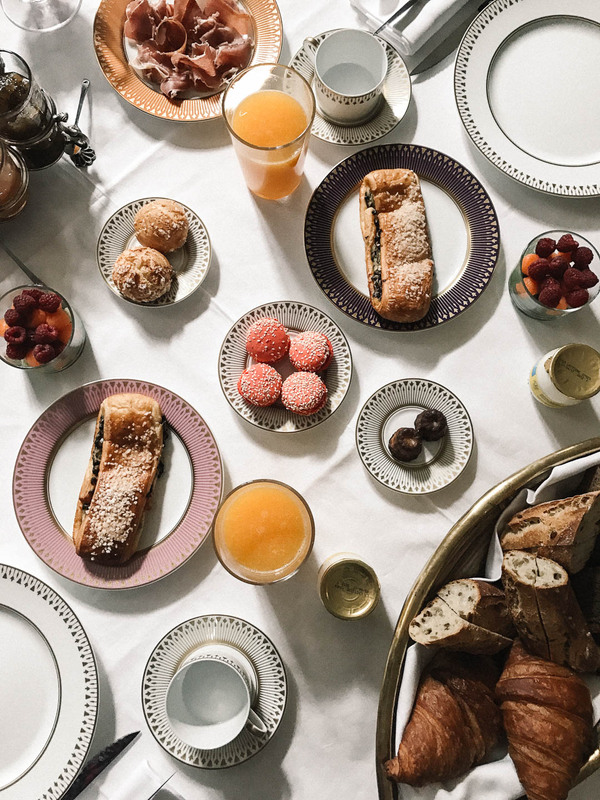 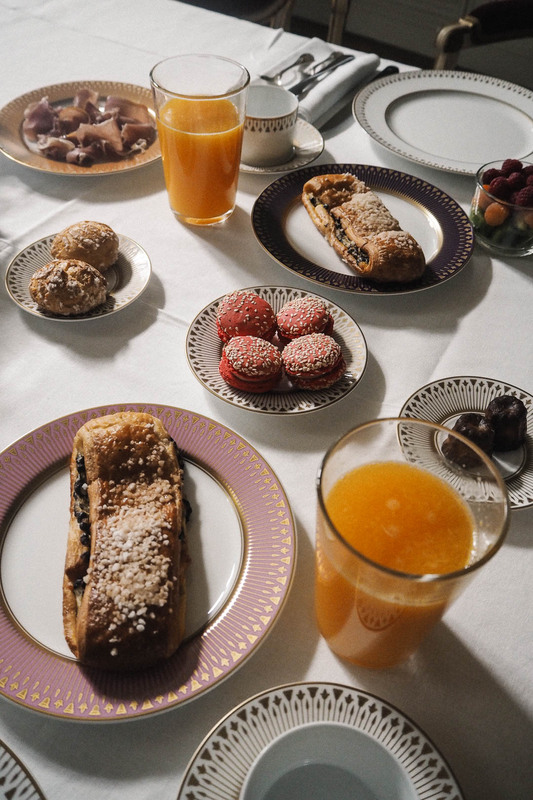 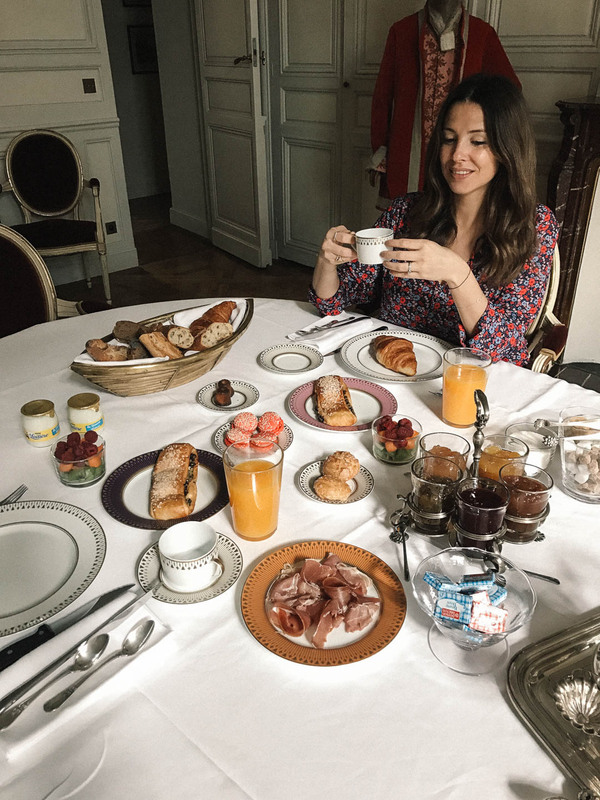 Hotel de la Tresne offer breakfast and a daily cleaning service at an extra charge, and we certainly took advantage of the breakfast one of the days we stayed there, sampling the most delicious fresh pastries, bread, freshly squeezed orange juice, coffee and fruit. 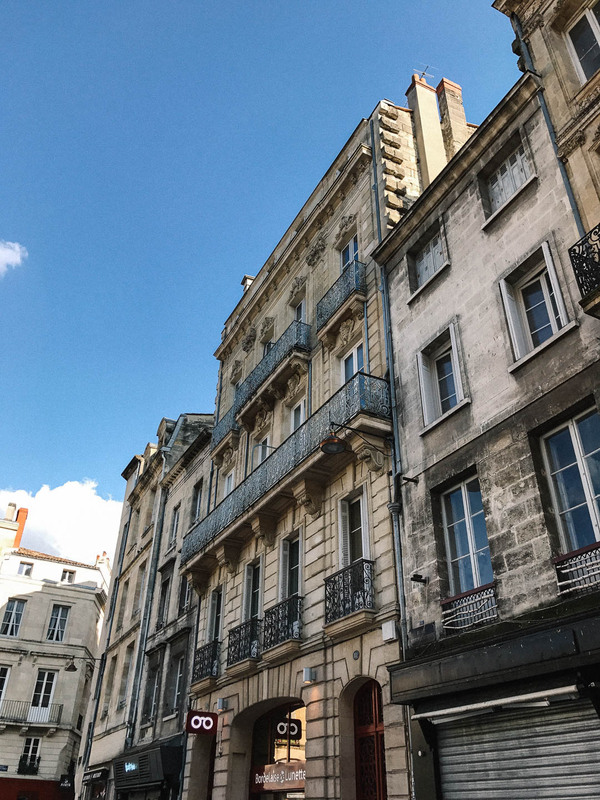 For the other days, we stocked up the fridge with groceries from the local supermarkets (located only minutes from the apartment). 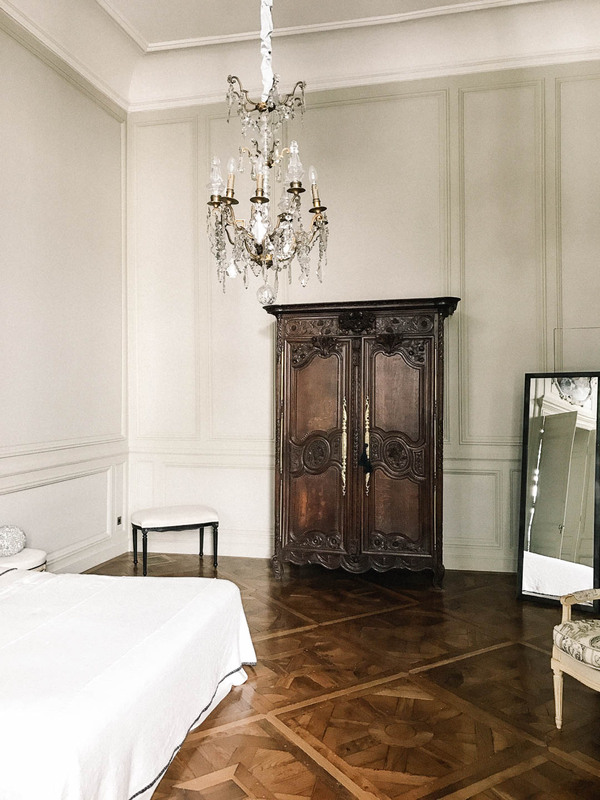 Obviously, we chose the (astronomically) largest room out of the three – and although this was the most stunning room, the smaller ones were a bit cosier. 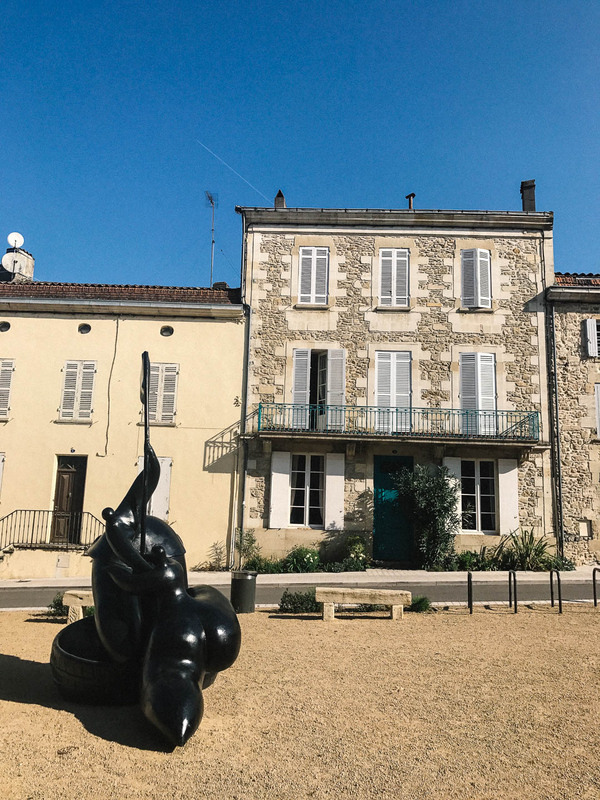 The philosophy of the hotel, part of the MILLESIME Collection, is to “showcase the history of our places and find their soul, creating a subtle balance between modernity and time, whilst offering our guests a home away from home”. 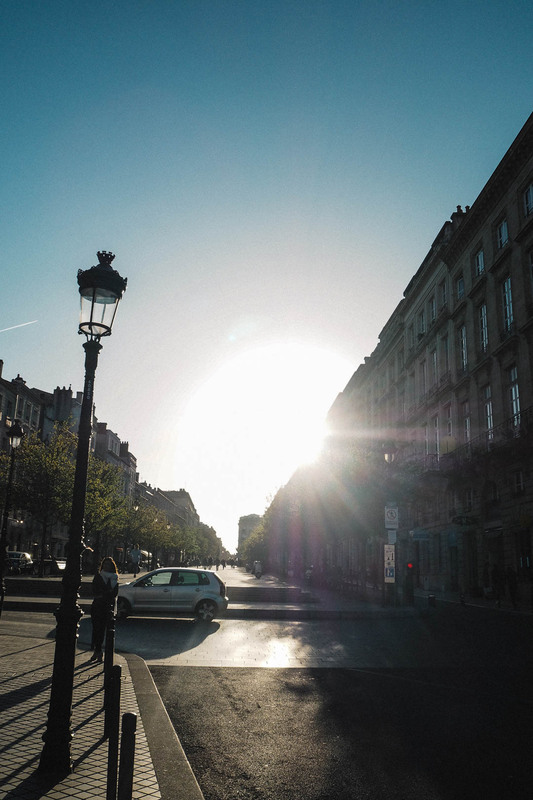 And that is exactly what it felt like. 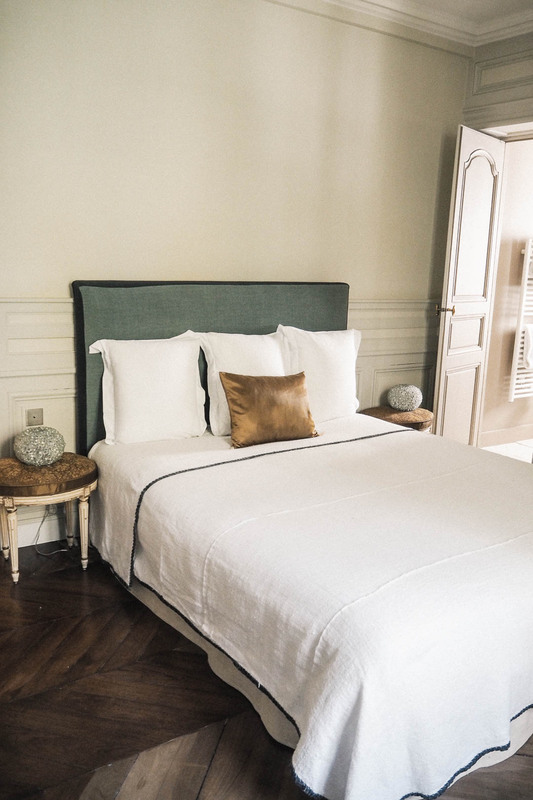 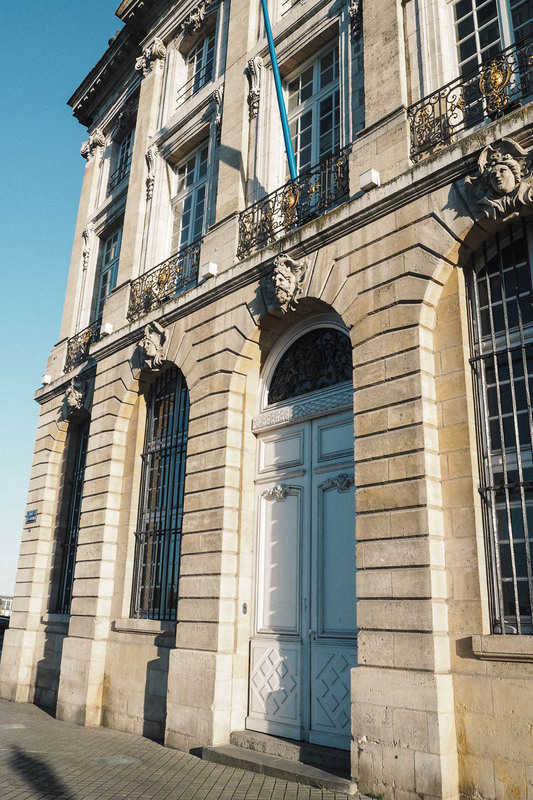 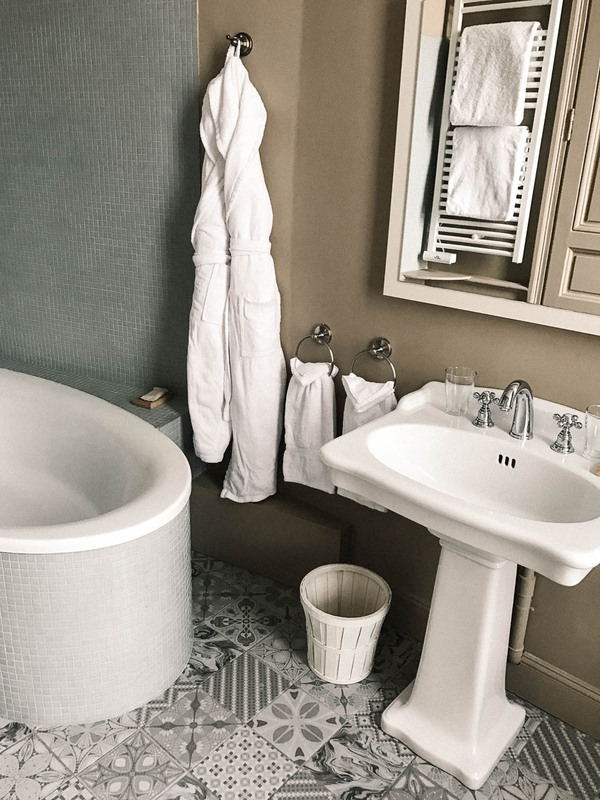 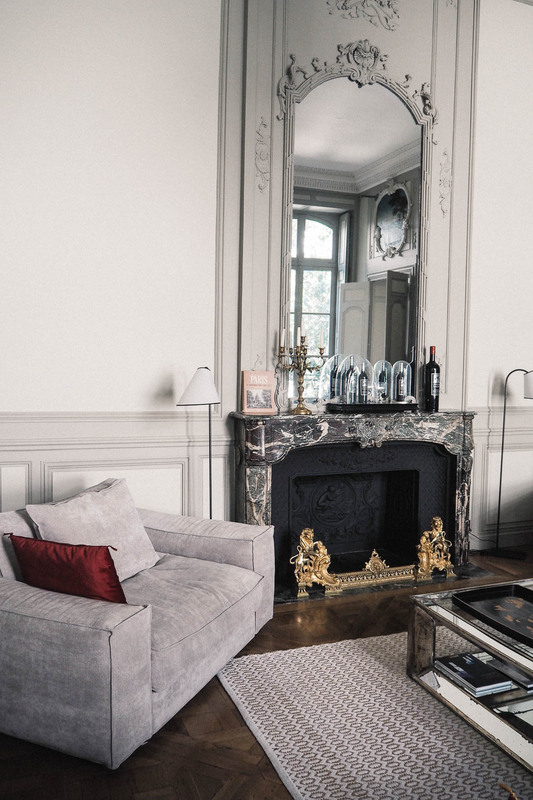 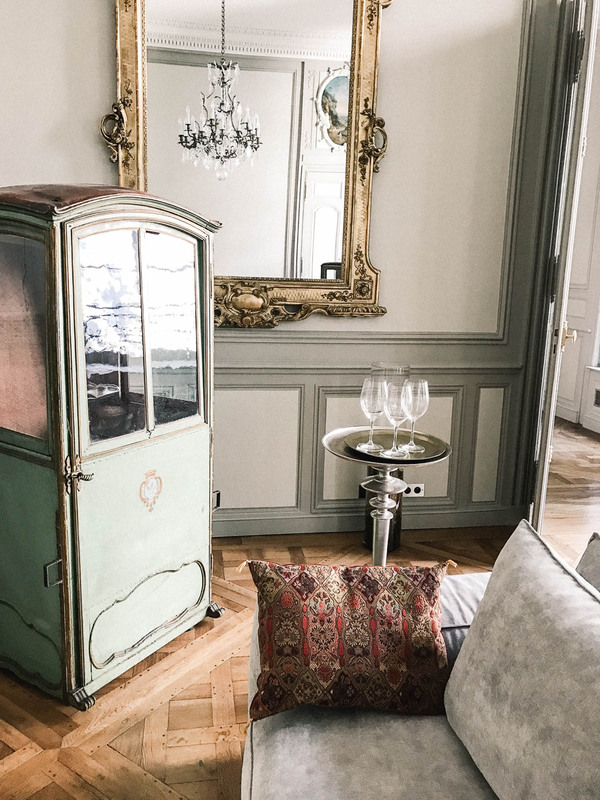 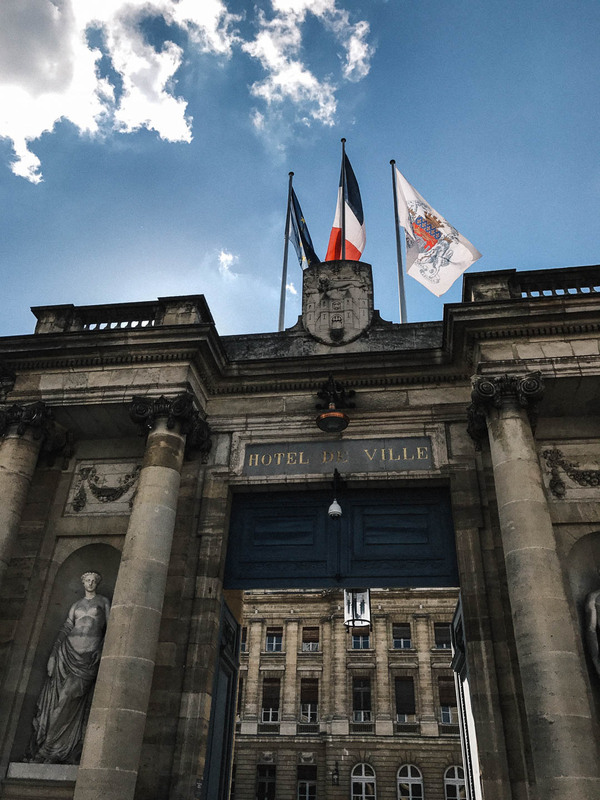 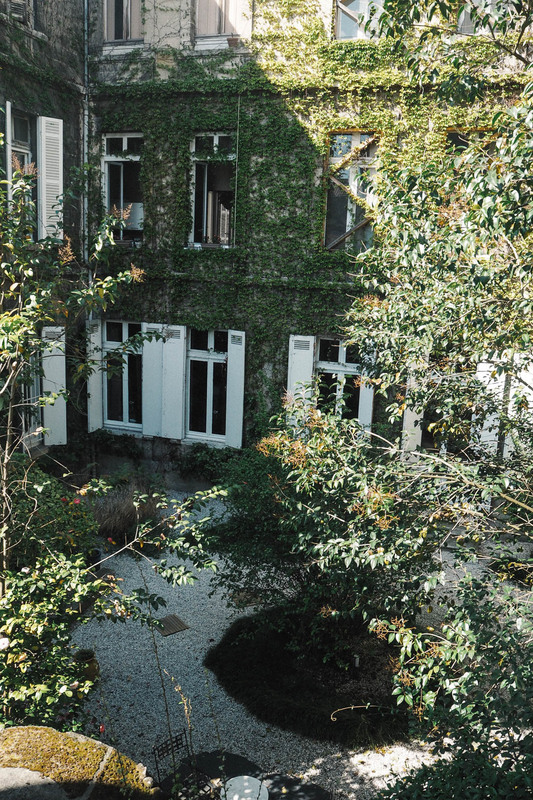 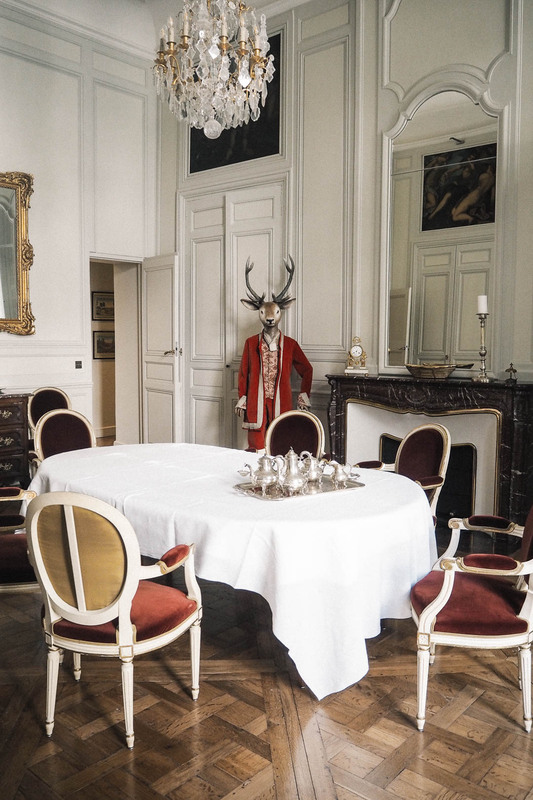 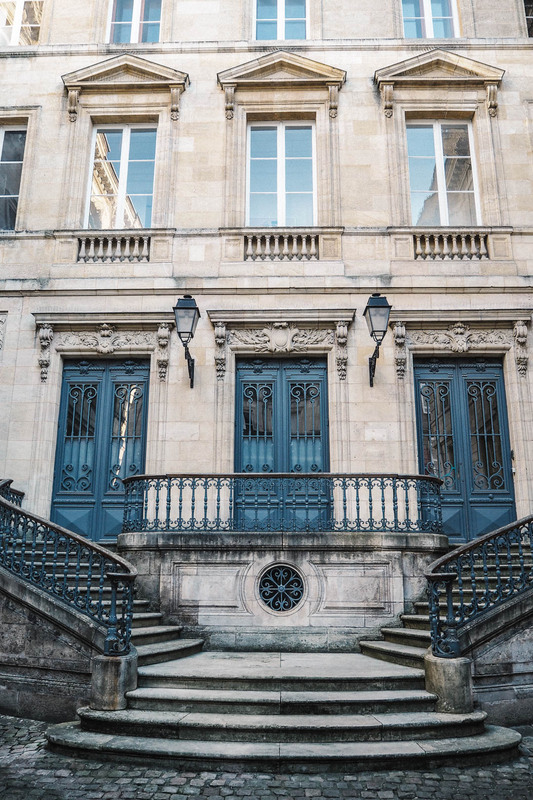 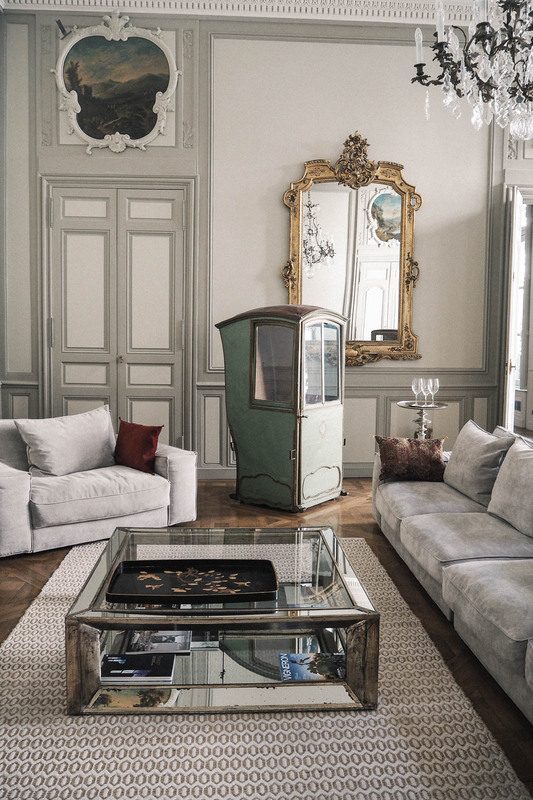 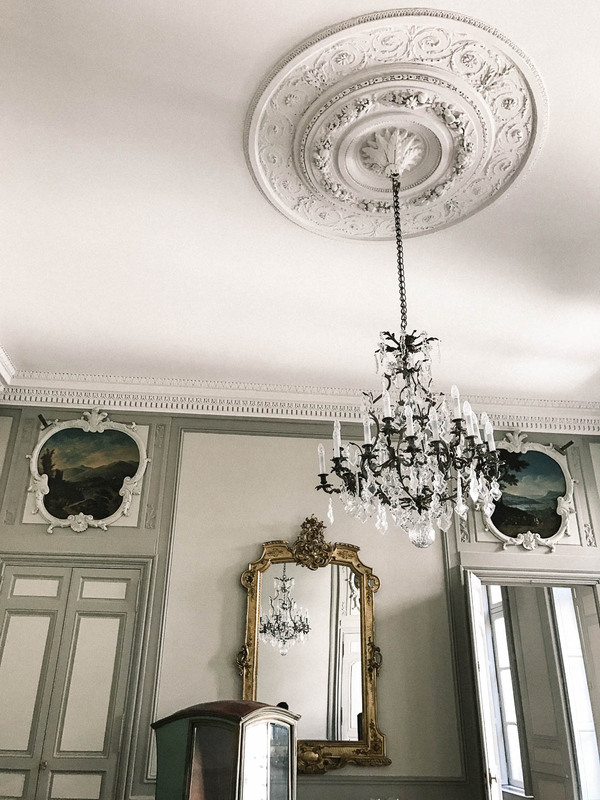 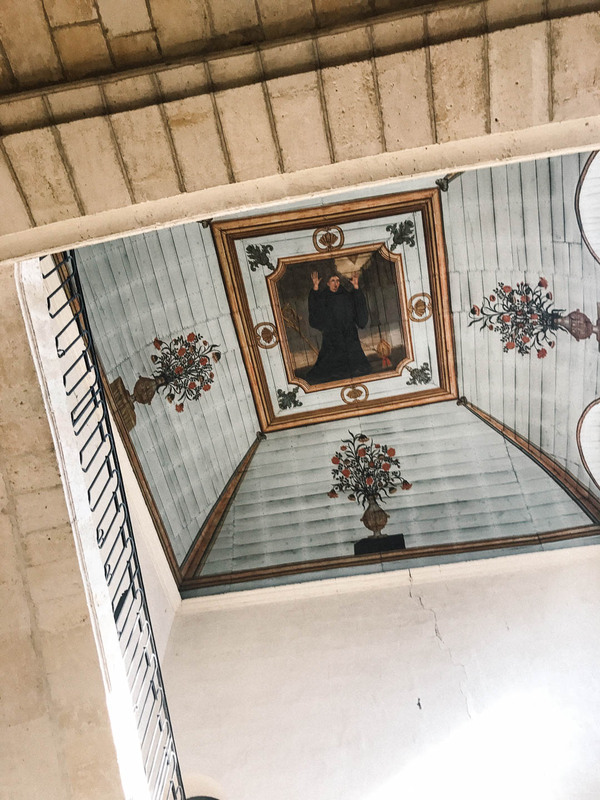 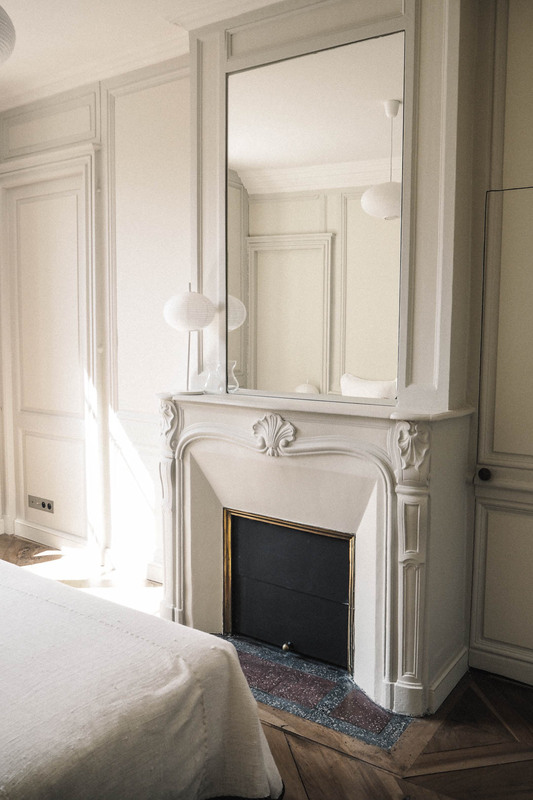 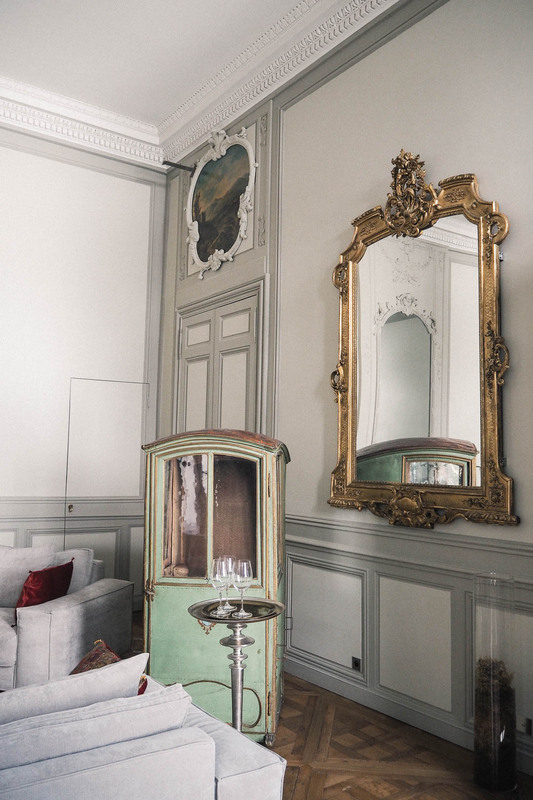 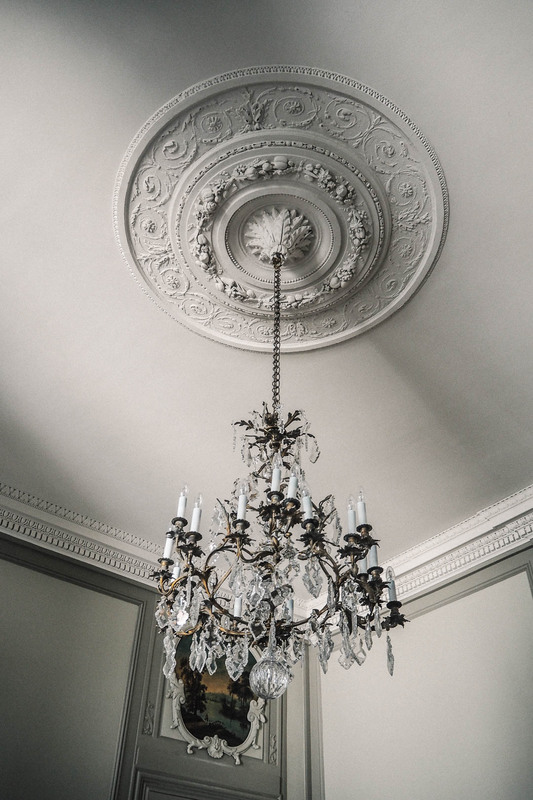 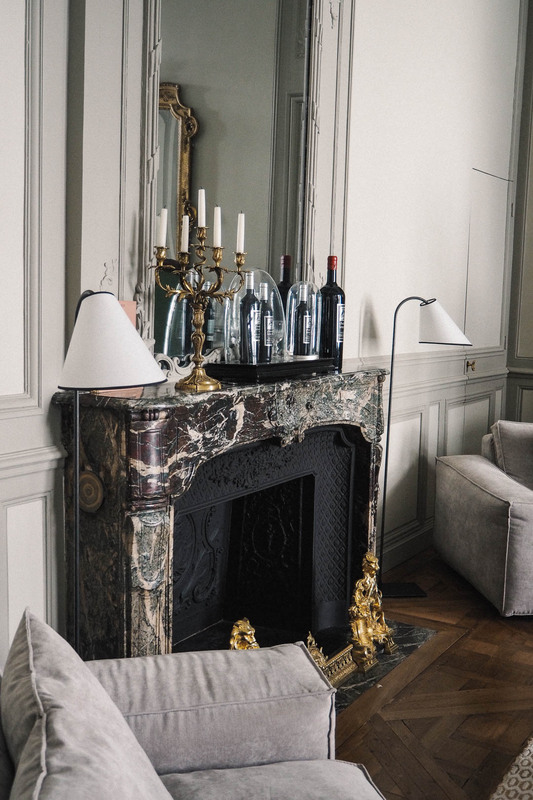 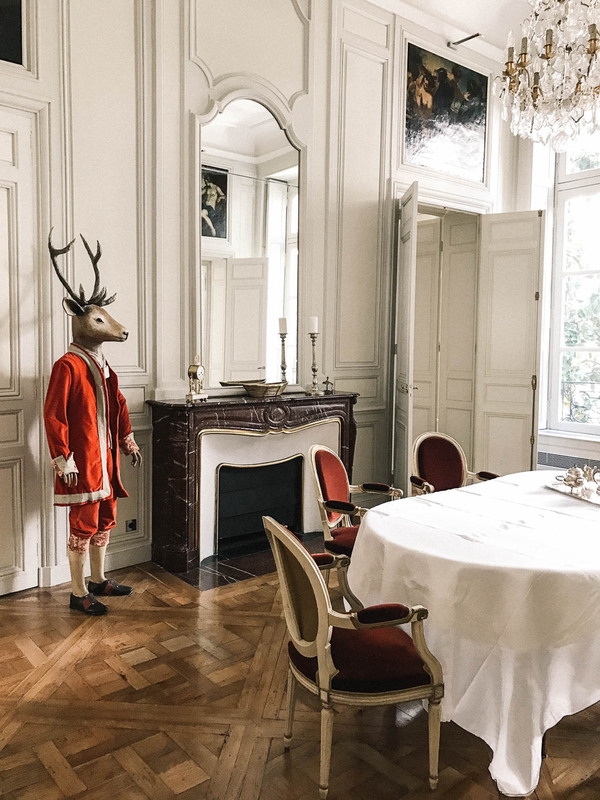 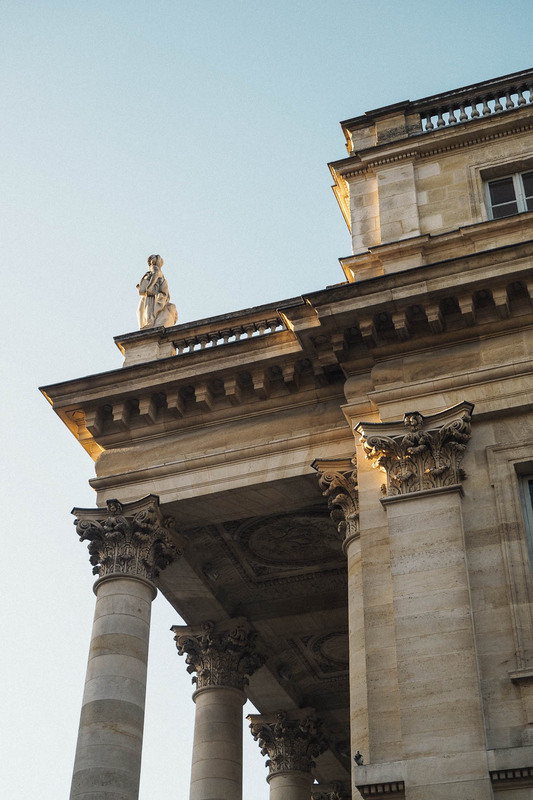 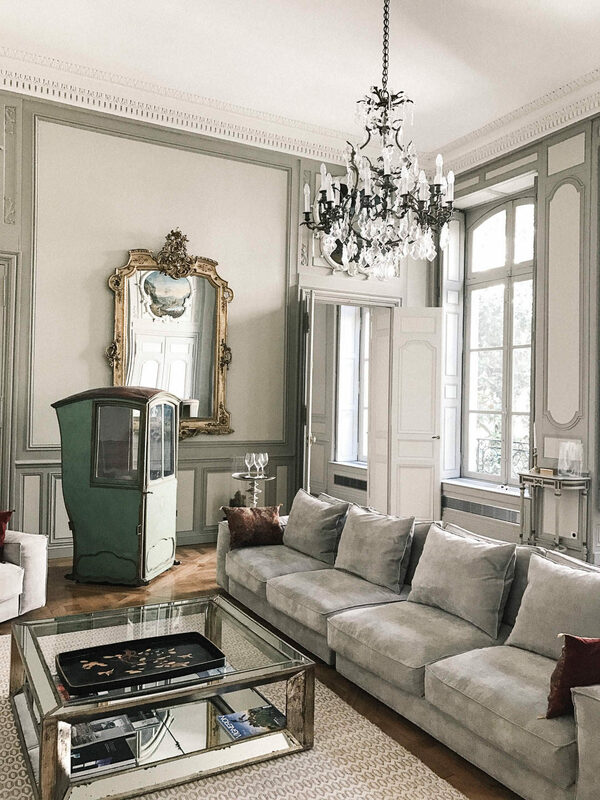 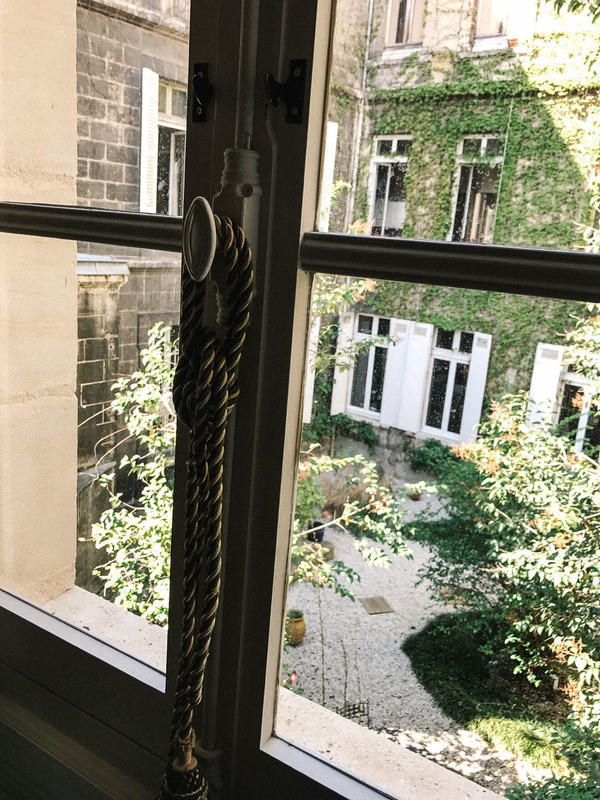 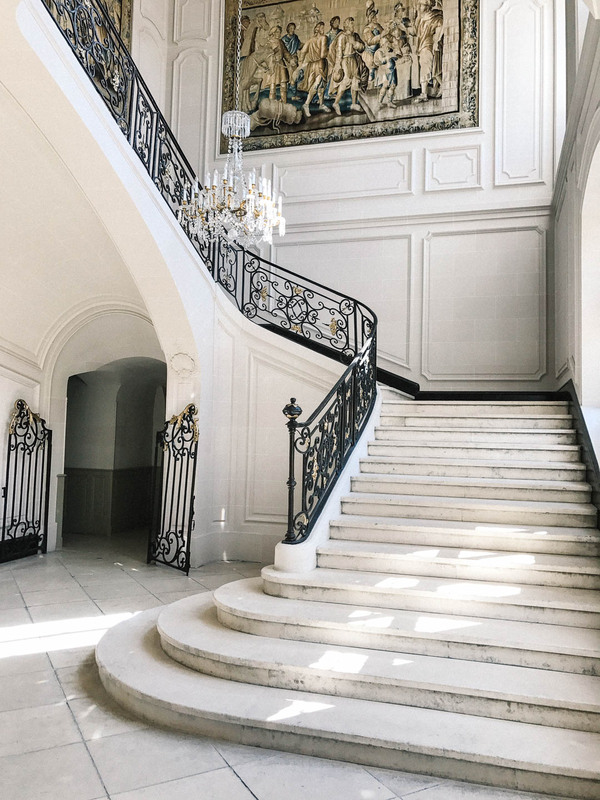 Granted, a pretty elevated and grand home it may be; yet everything about staying here, made us feel comfortable, relaxed and fortunate to be experiencing such a time piece of Bordeaux´s rich architectural heritage. 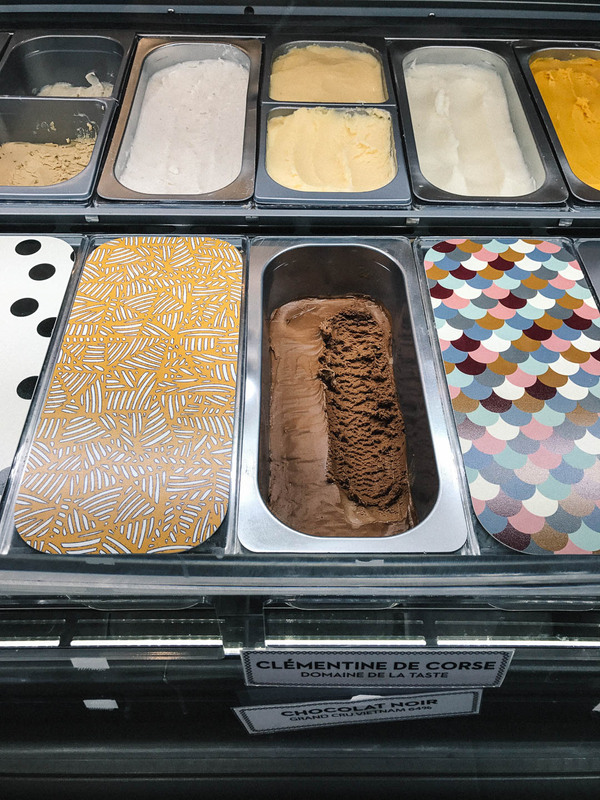 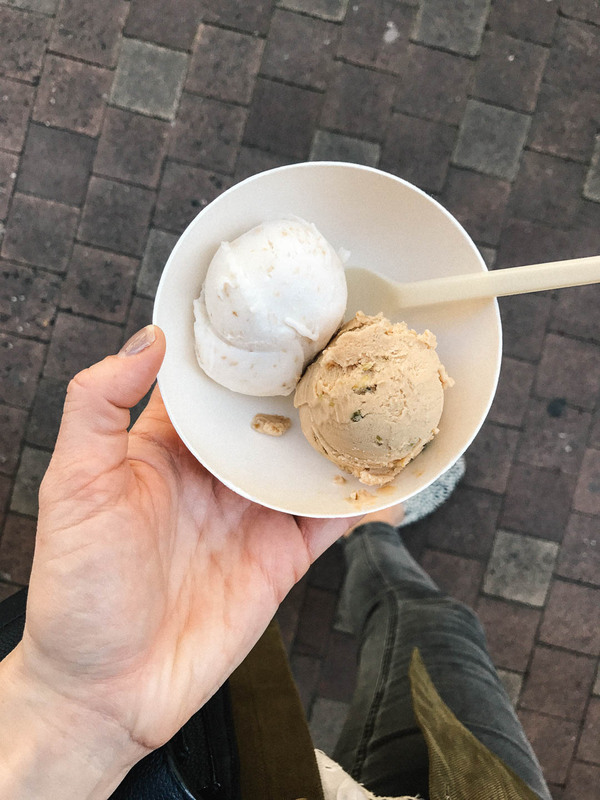 After checking in, we headed out for the last hours of sunshine, and some ice cream from La Fabrique Givrée (organic and relatively guilt-free). 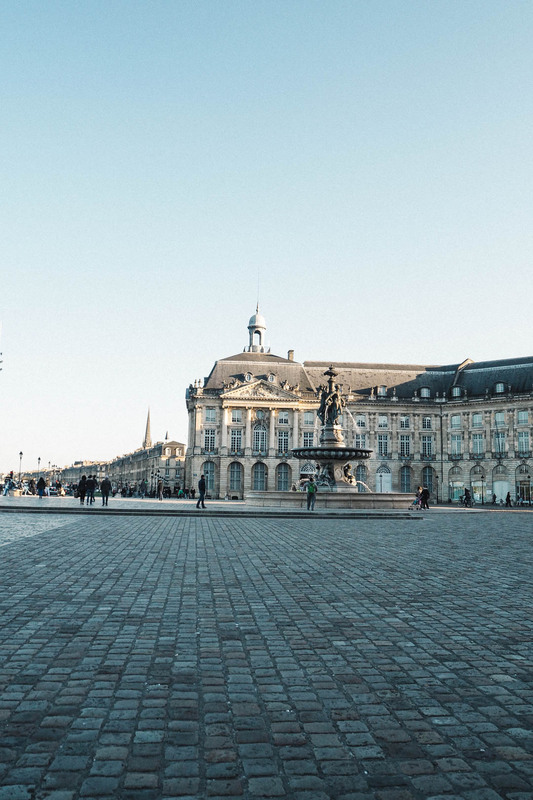 I was told to not plan to much for Bordeaux, and just spend the days walking around and exploring the city. 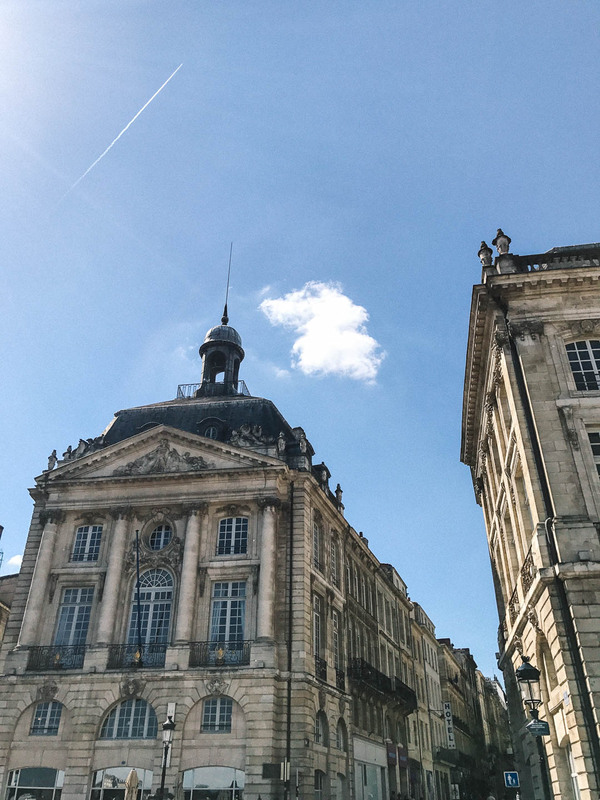 The heart of it is all walkable, and it felt nice not having an itinerary for once! 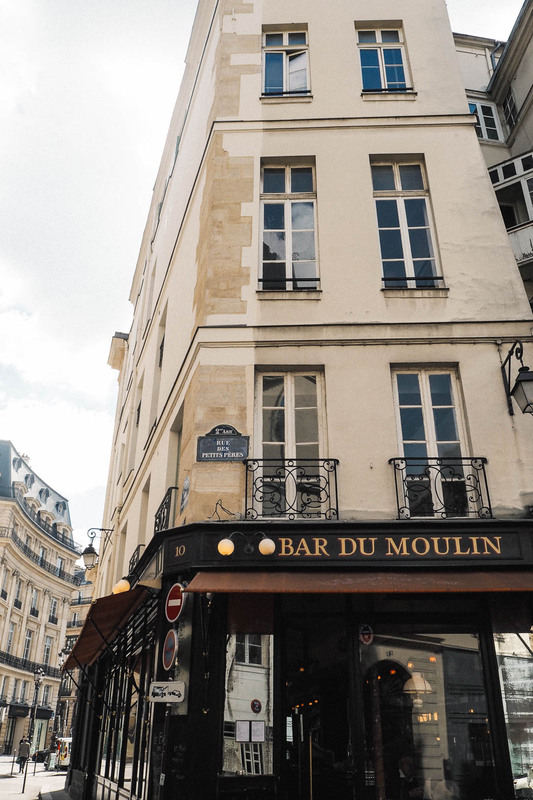 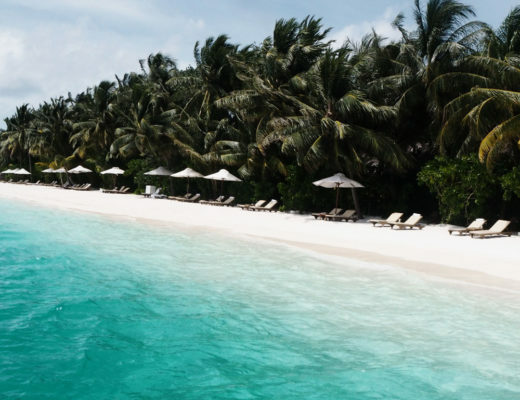 Of course, as always, I had researched and planned where to eat, but in terms of the sights, we just took it all in and with no map or plan, ended up having the most relaxing time. 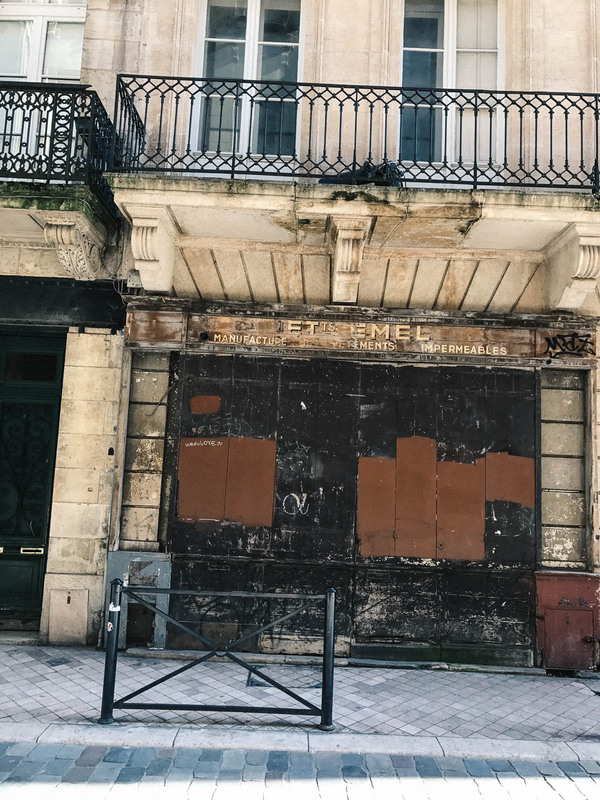 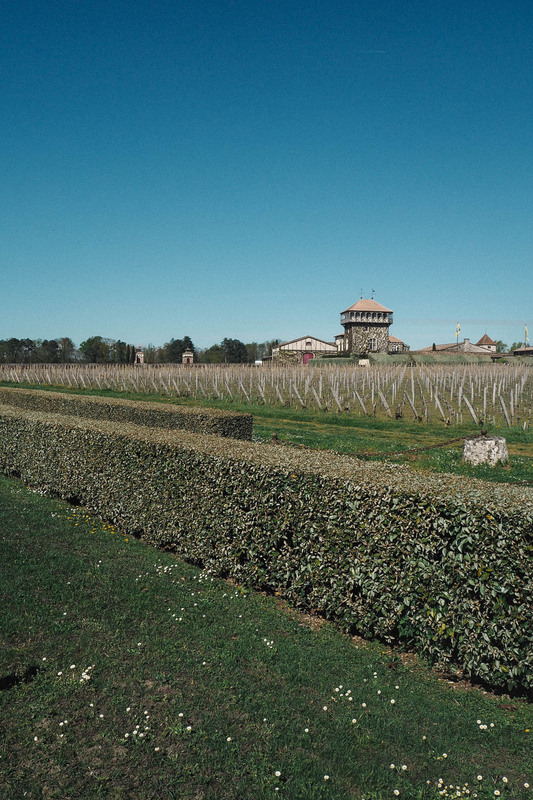 We arrived to Bordeaux on a Monday, and most of the places I tried to book was closed. 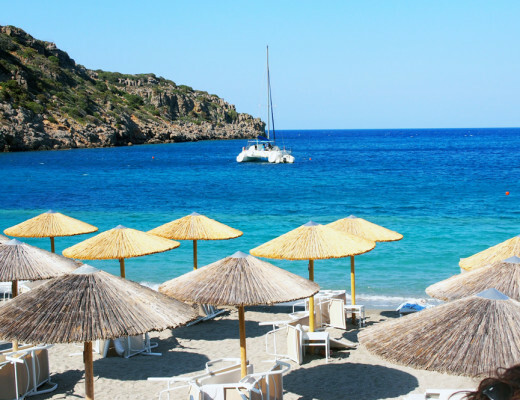 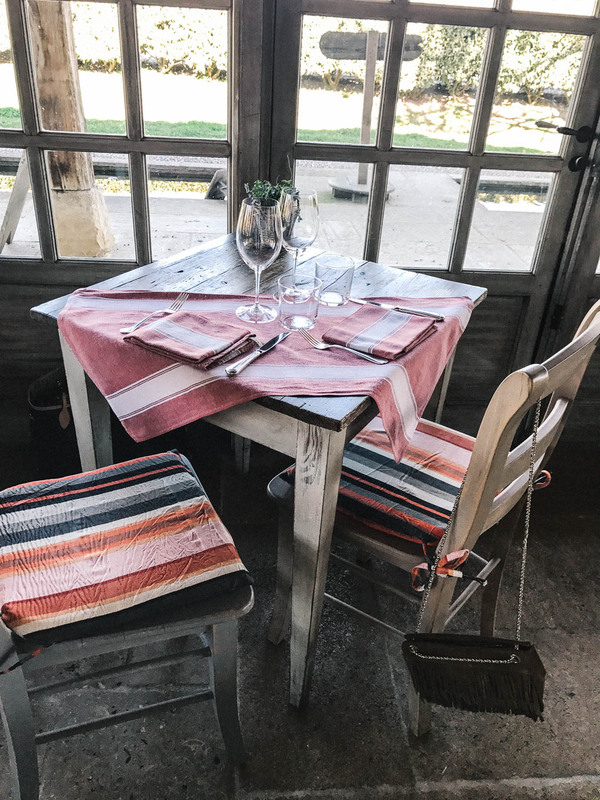 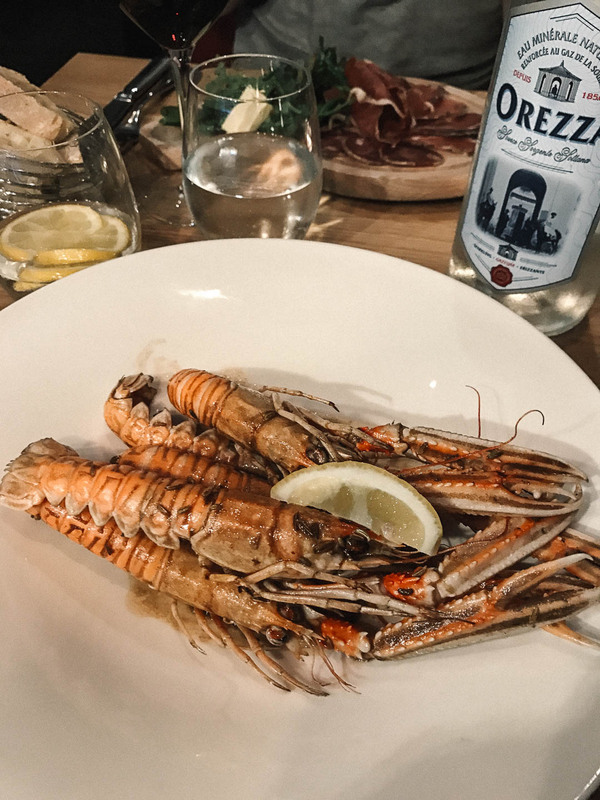 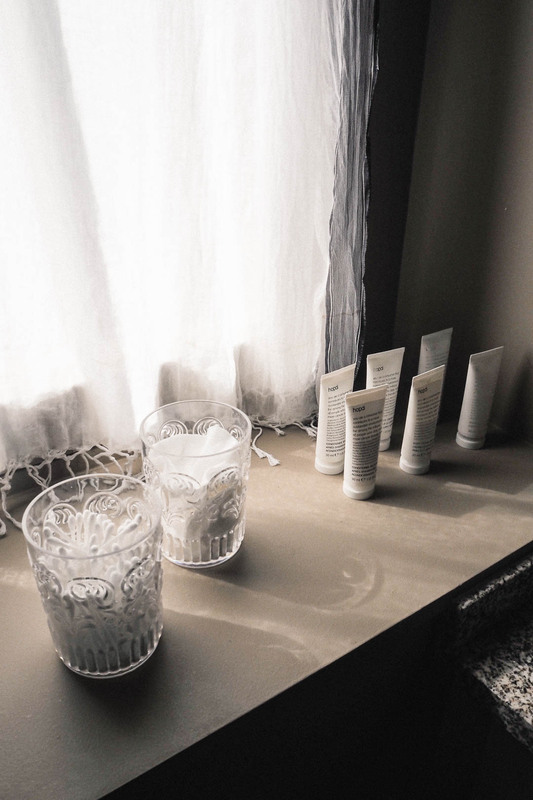 Luckily our lovely host, Emily from Hotel de La Tresne, had already made lots of lovely recommendations for us, including A Cantina Brasserie Corse – a Corsican restaurant, with a French twist. 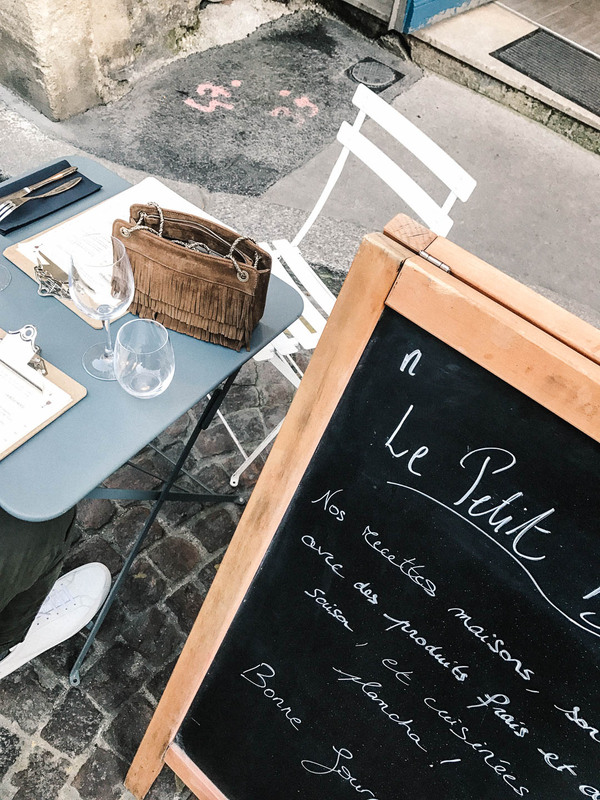 The food was great, but the service was truly what made this little hidden gem. 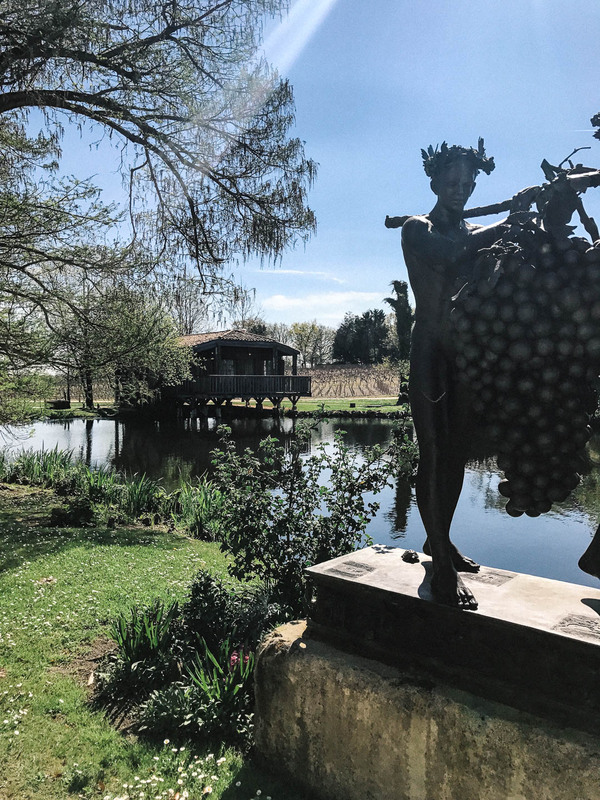 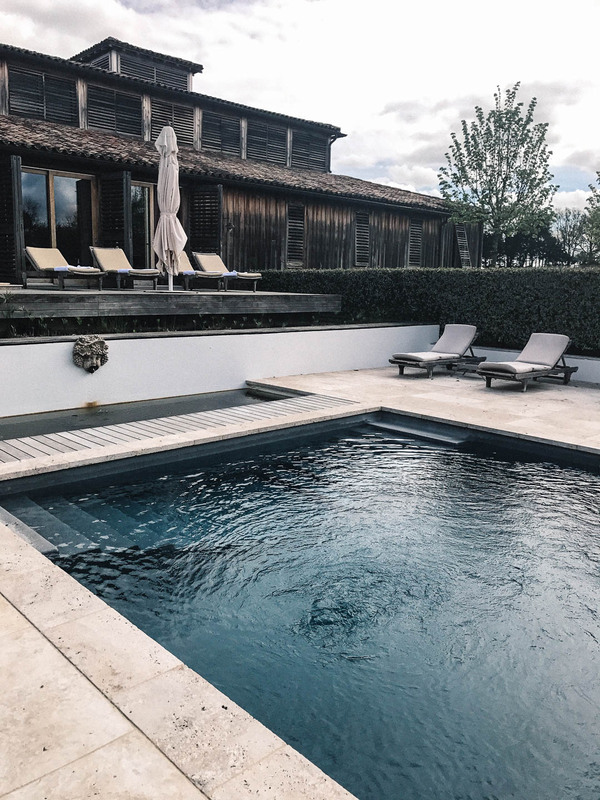 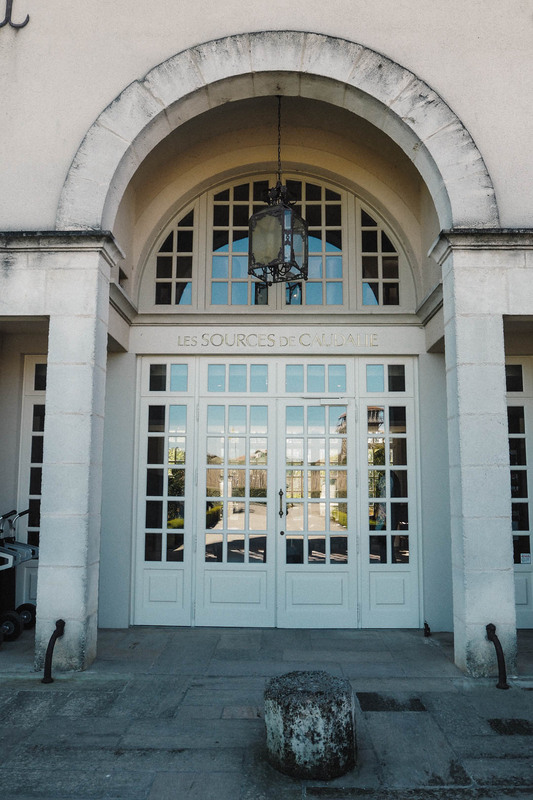 The next morning, we jumped in our hire car and ventured 30 minutes outside of Bordeaux, for a spa day and lunch at the stunning Les Sources De Caudalie. 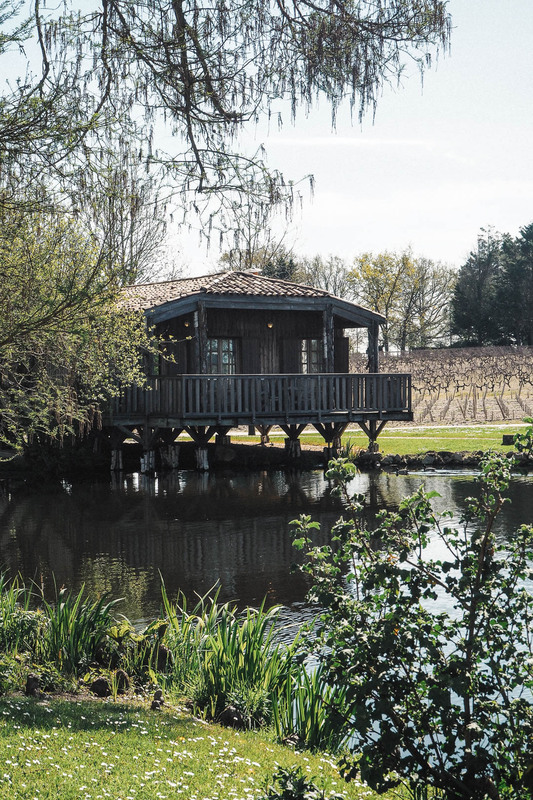 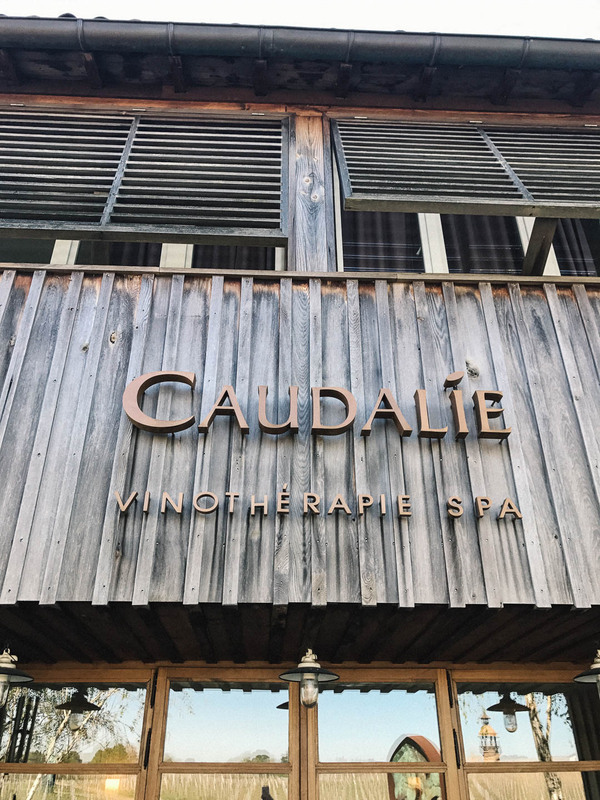 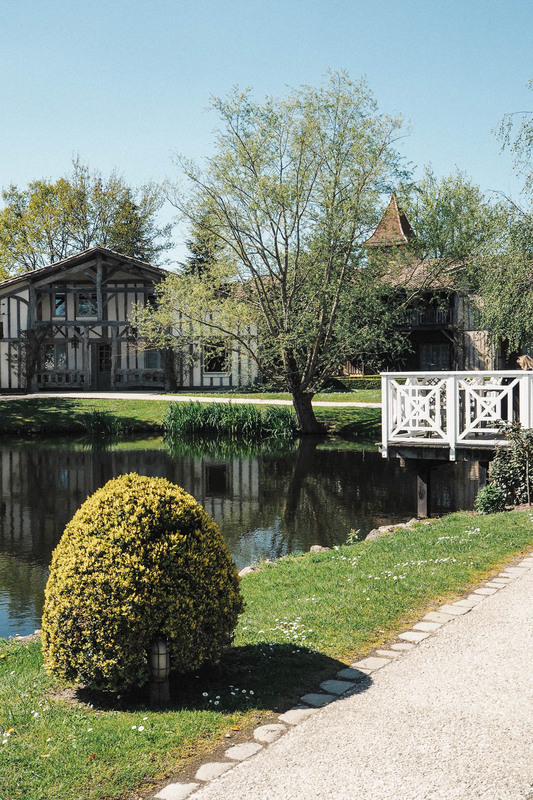 The owner of this wine-inspired spa and ultra chic country hotel, is French beauty brand Caudalie – so expect nothing less than perfection. 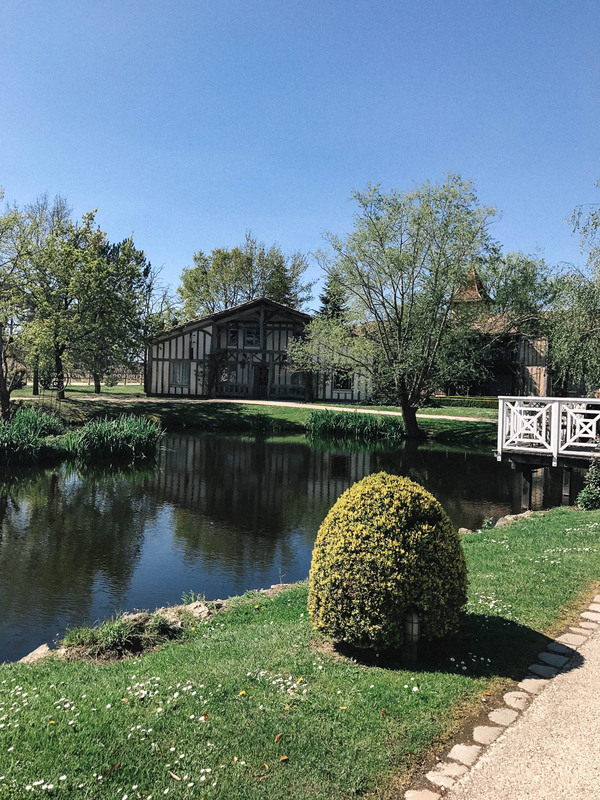 The spa hotel is surrounded by peaceful gardens around a lake with swans, a large indoor and outdoor pool, hot tub and natural hot-water spring. 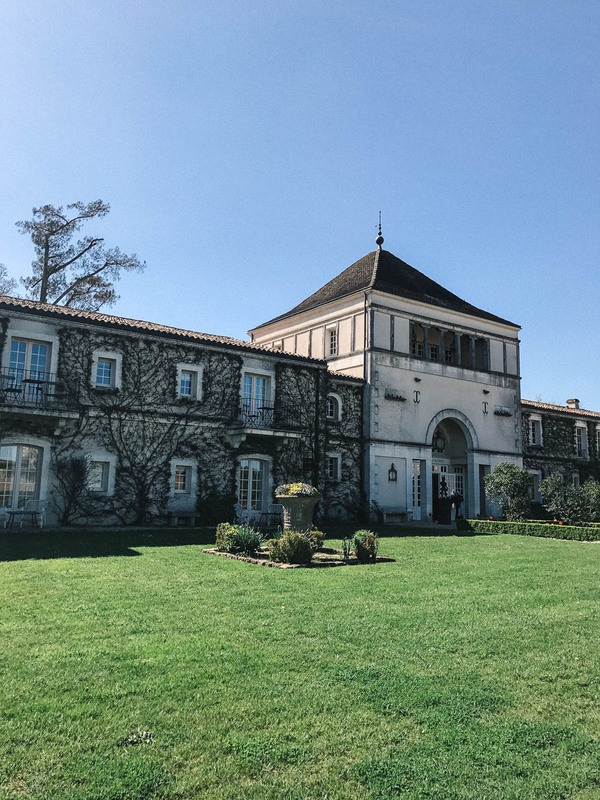 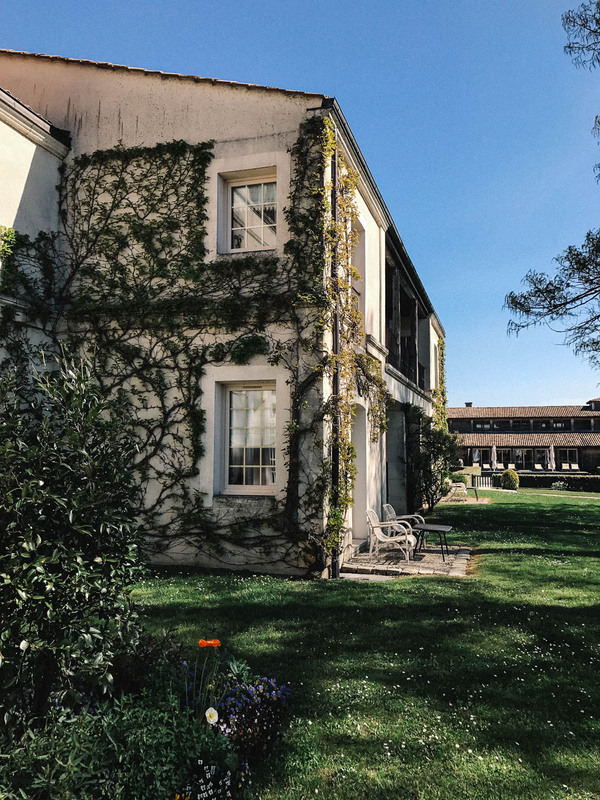 After an incredibly relaxing facial at the Vinotherapie Spa – we ventured across for lunch at La Grand’Vigne, the two-Michelin starred restaurant by Chef Nicholas Masse, set in a former orangery, 18th-century glasshouse. 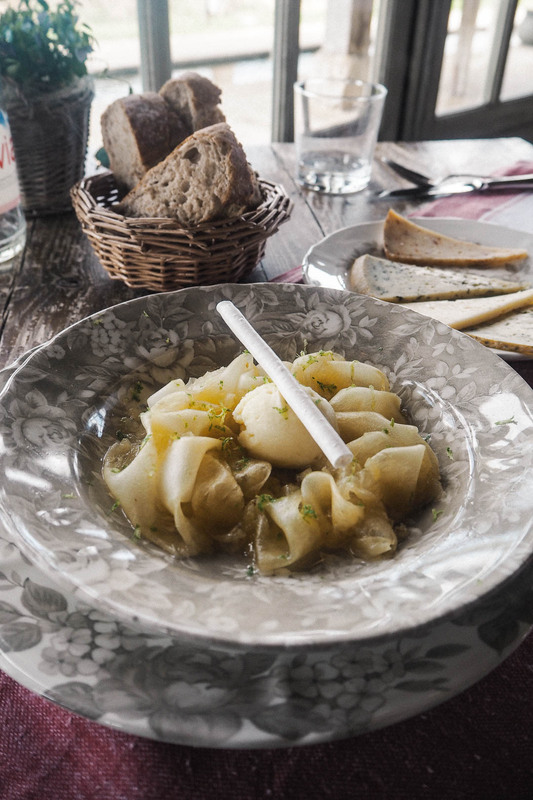 Serving seasonal produce from the hotel´s own vegetable garden, the food was excellent. 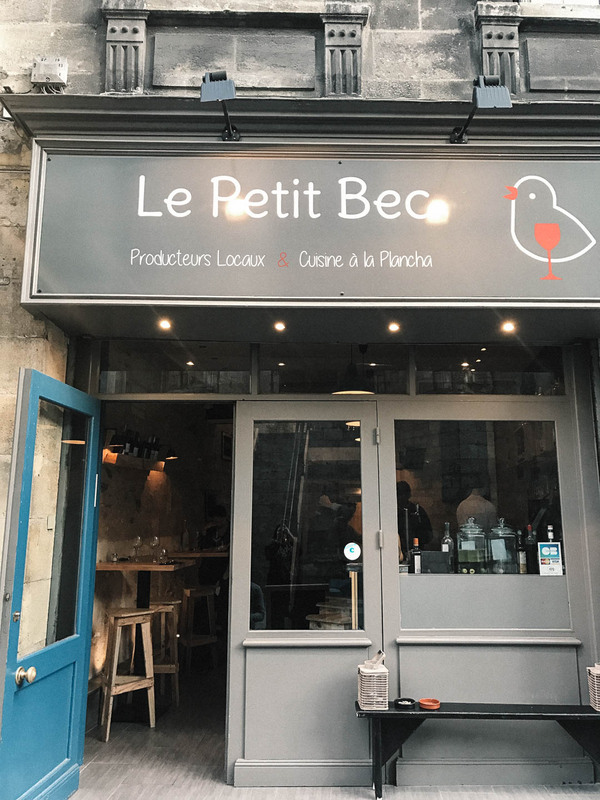 After the spa, we made our way back into town, chilled and got ready for an al fresco dinner at Le Petit Bec – a super charming restaurant, only serving local and seasonal cuisine. 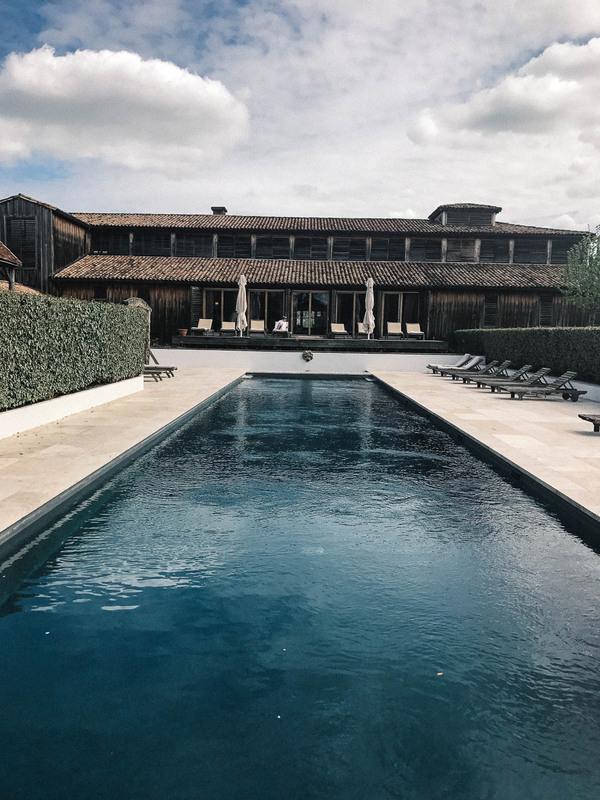 Incredible service, amazing wine and food – one of our highlights from the trip! 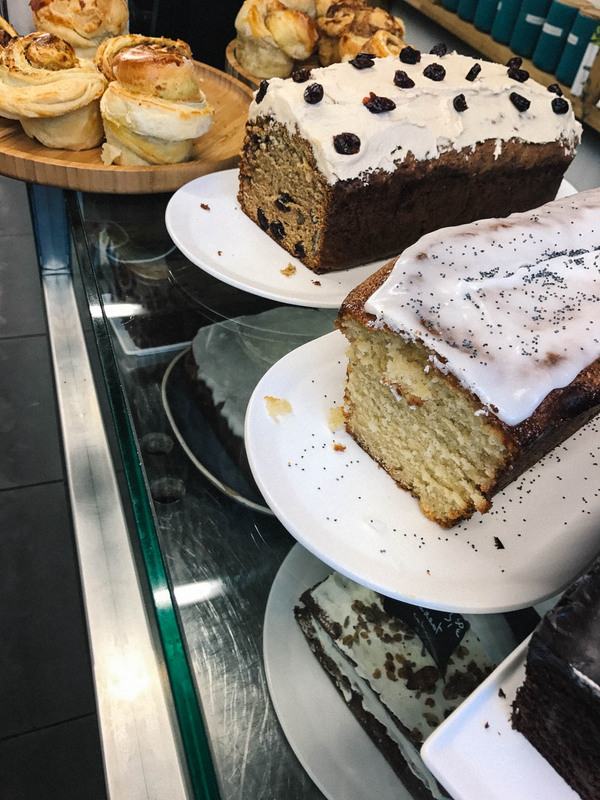 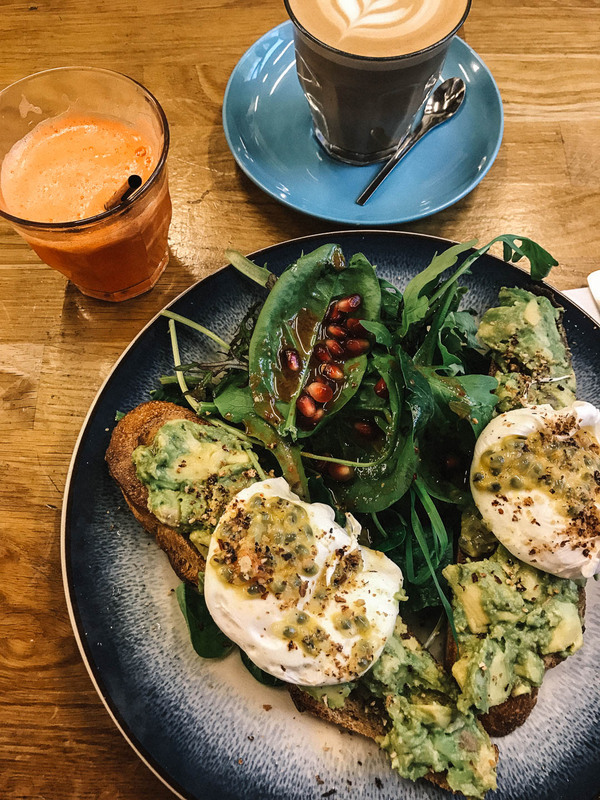 After an early morning of exploring the city, we had worked our way up to an appetite for breakfast at Black List Café – serving the best avo & egg, cakes and pastries, freshly squeezed juices, coffee and Matcha. 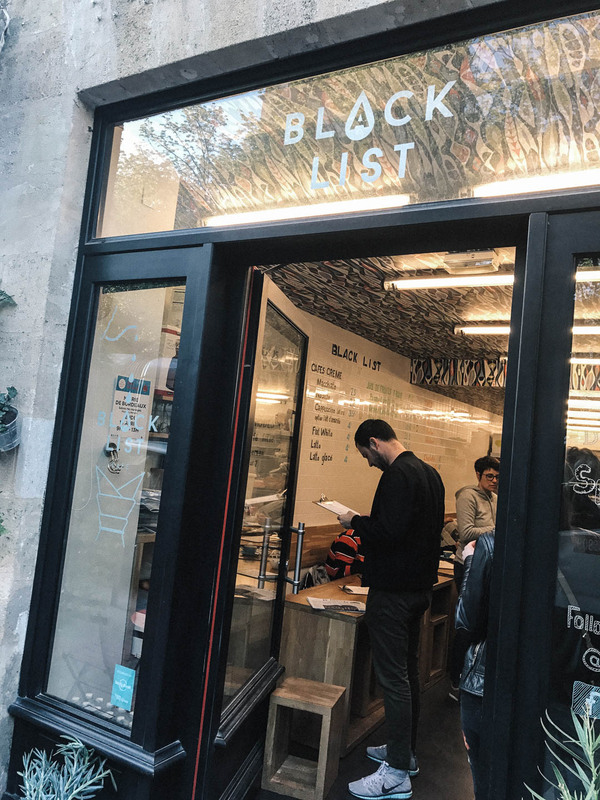 Service might be a bit slow and chaotic (especially during rush hour), but still worth a visit. 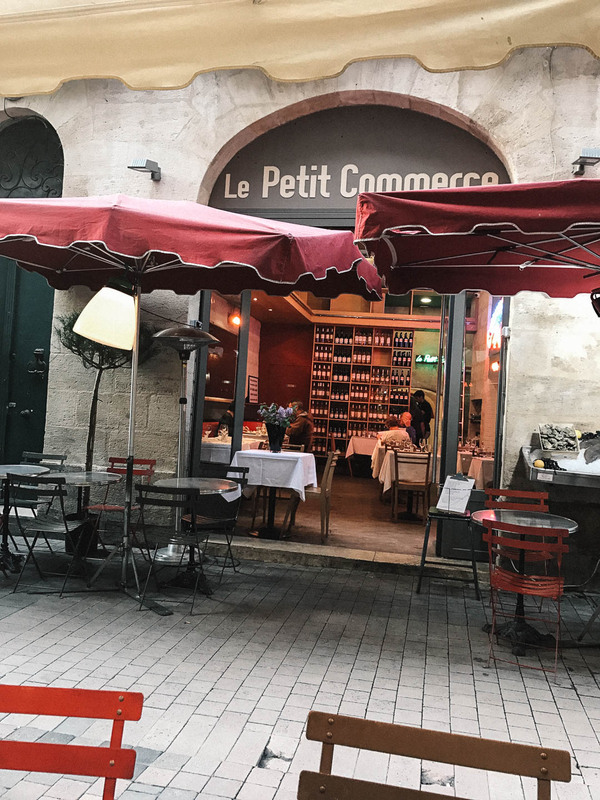 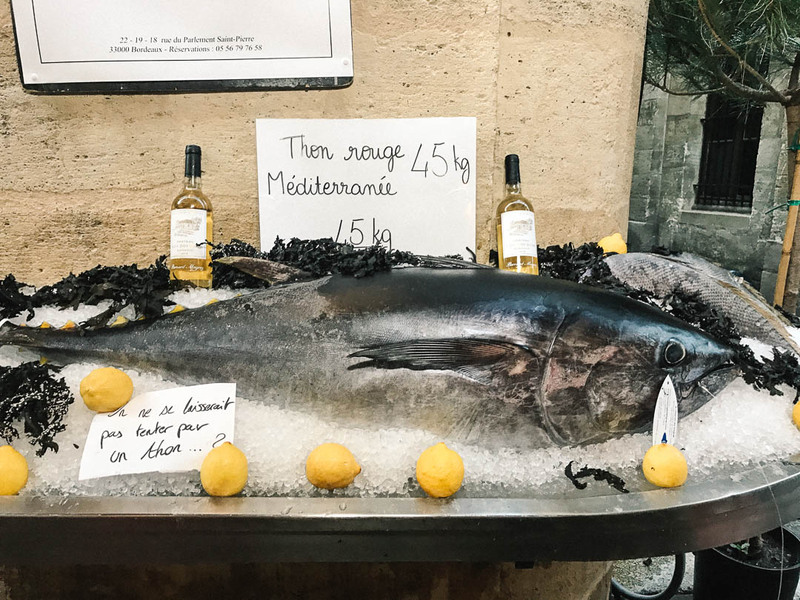 On our final night, we headed to Le Petit Commerce for dinner, a gorgeous fish restaurant, located in one of the most popular spots for bars and restaurants. 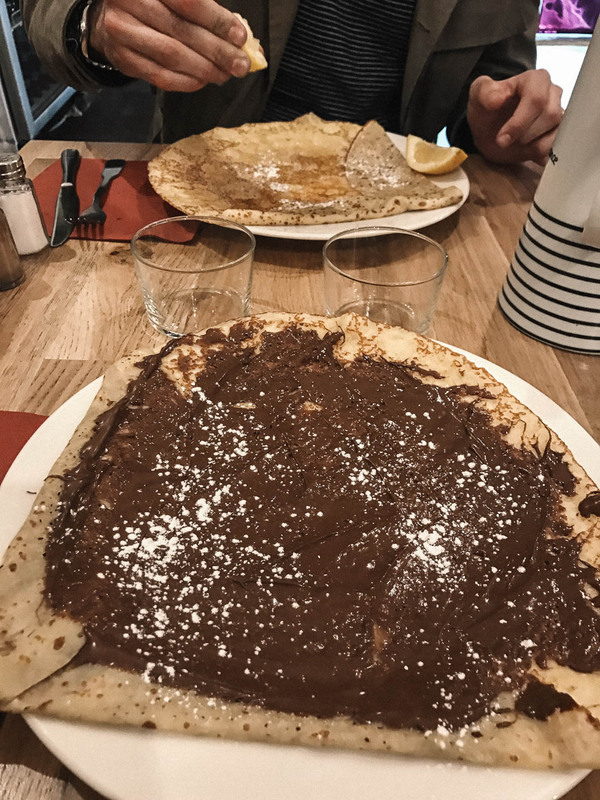 This place was recommended to me by a lovely reader via Instagram, and thank god she did! 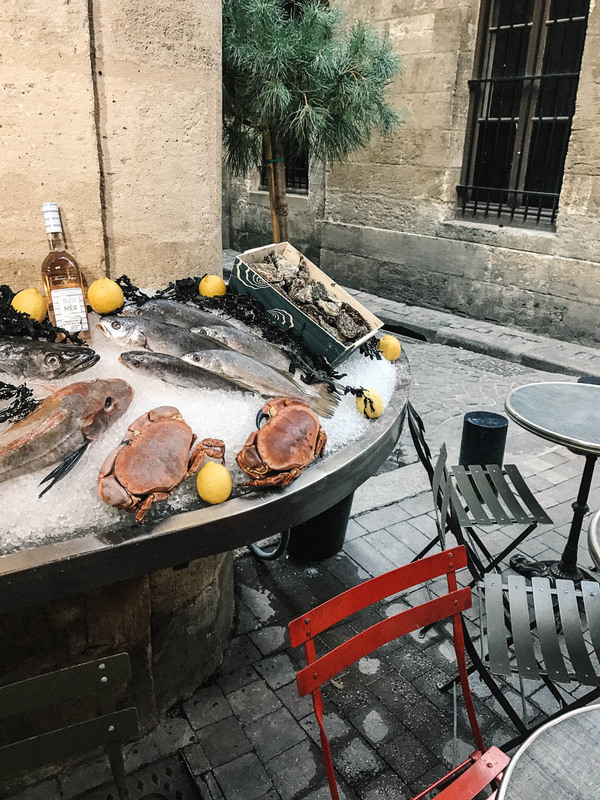 We feasted on grilled calamari, oysters, jumbo prawns and meaty white fish, whilst watching the world go by on the outside terrace. 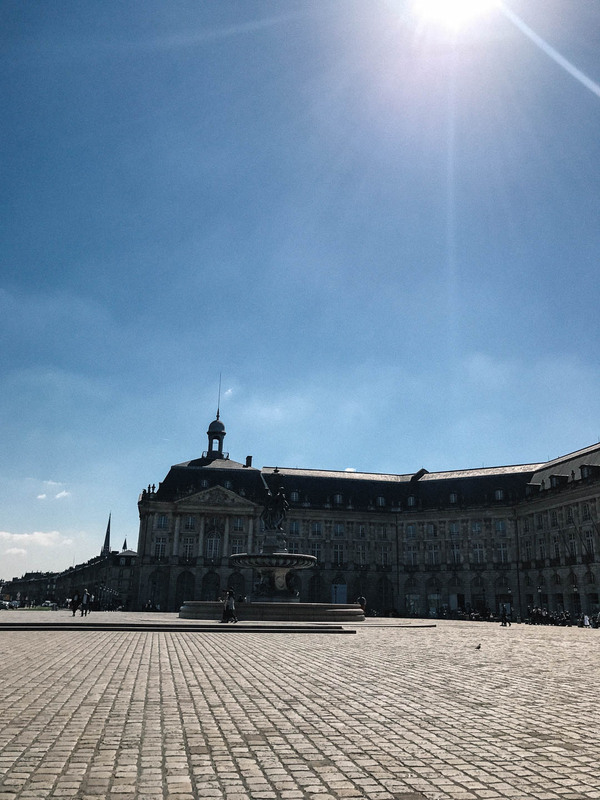 What a city. 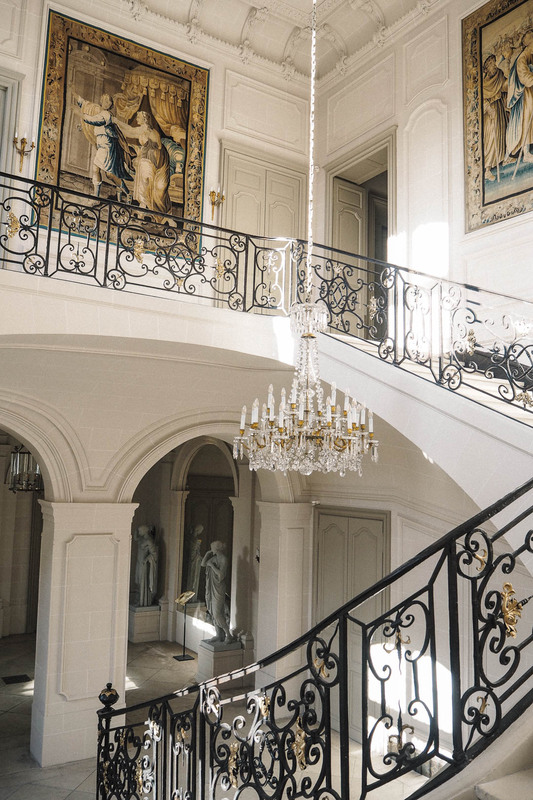 What a magical place. 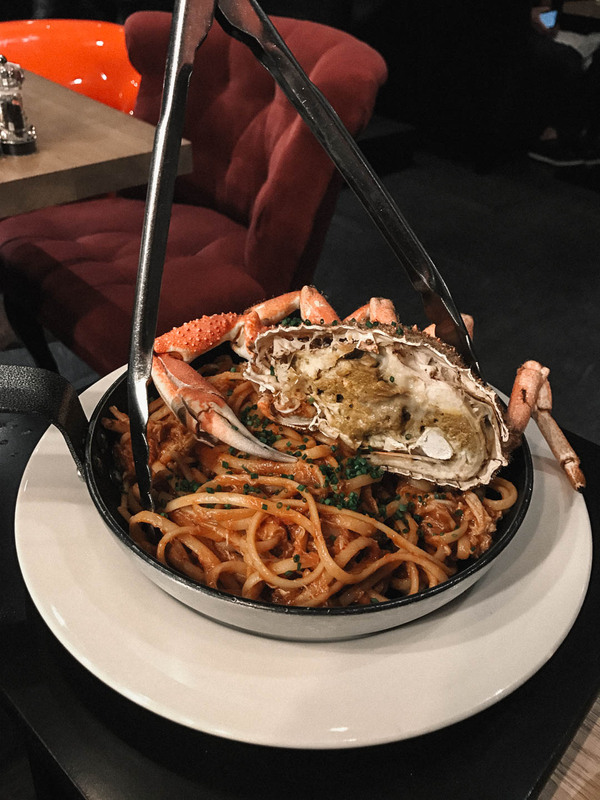 Four days was enough to get a taste of the place, but it certainly got my hunger going for more. 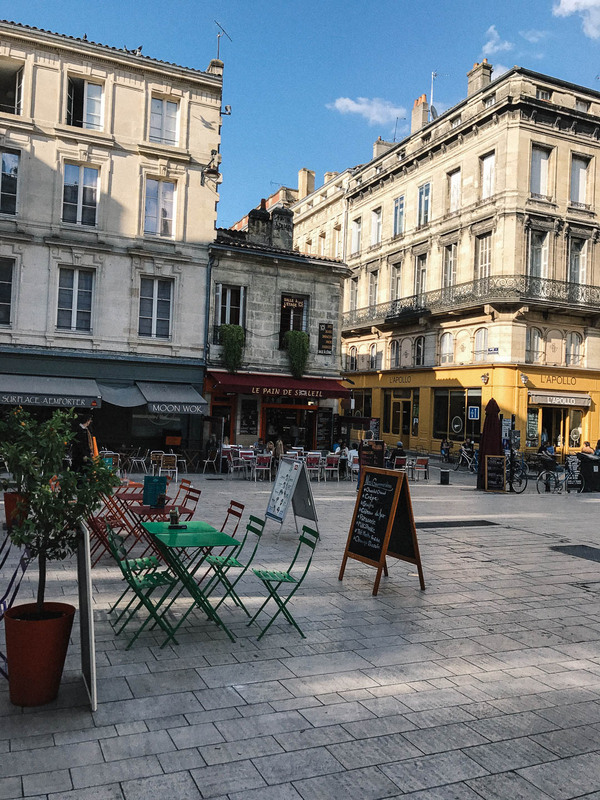 Luckily, this is an area of France I cannot wait to explore and spend more time in the years to come. 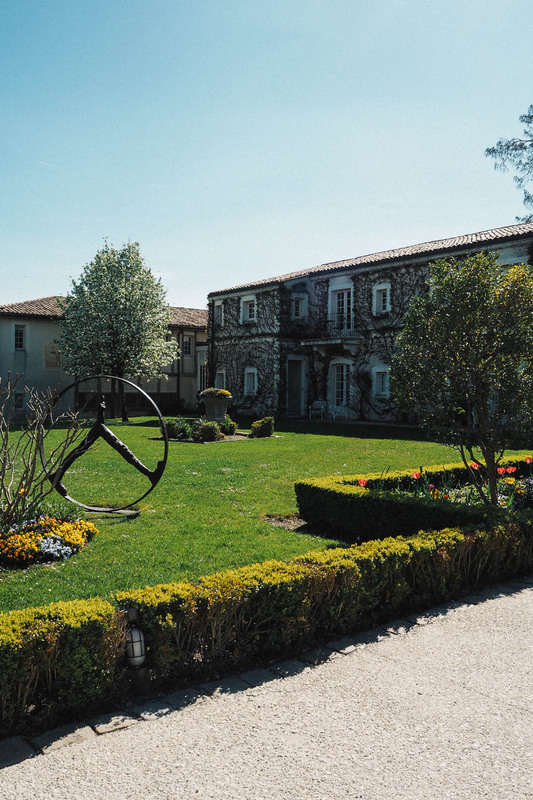 We stayed at Hotel de La Tresne, part of the MILLESIME Hotel Collection, on a complimentary basis.